My ride home from work. We have often talked about how we travel around this lovely country but I don’t think we have actually shown you. This short posting will attempt to do this. 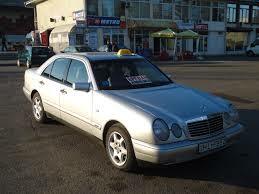 If you have a Taxi sign you can put it on your car and take passengers. One of the older overnight/local trains. 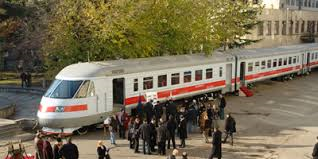 One of the express trains. This is a new bus but still packed to the gills. Believe it or not more will be getting on. When I travel to work each day I take either the bus or Marshrutka dependjng on the weather and the time of day. 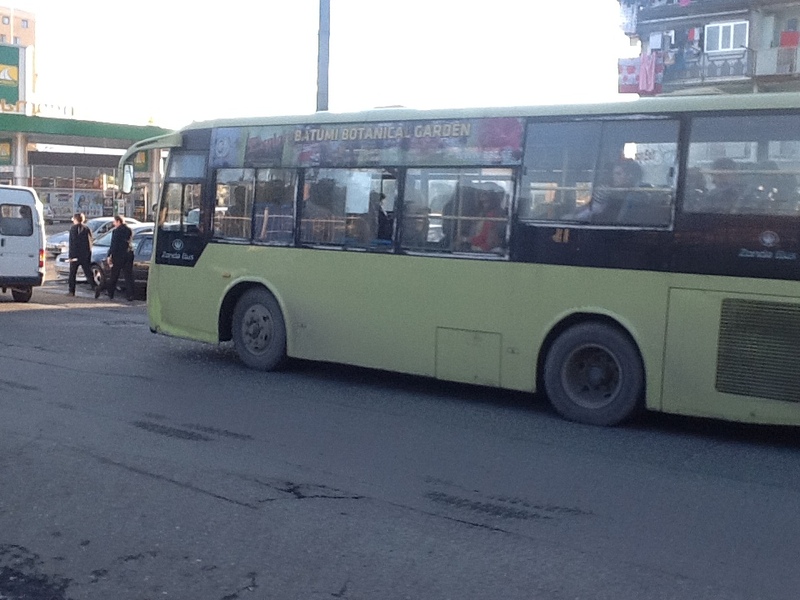 This post is to give you the experience of me traveling home on one of the Marshrutkas. The video is about 15 minutes long and feel free to skip through it. There are a couple of places you should view, they are found at 9:00 and 9:50 minutes into the video. I hope you enjoy the ride. Autumn in Georgia is deceptive. It can move from being summer-hot and sticky to fall rains and chill. Even into November we can have mild days but always with the threat of needing a heavy coat in the evening hours. This first picture is a good example of people enjoying the beach in mid-September and many of the concession stands on the “boulevard” still open for business. 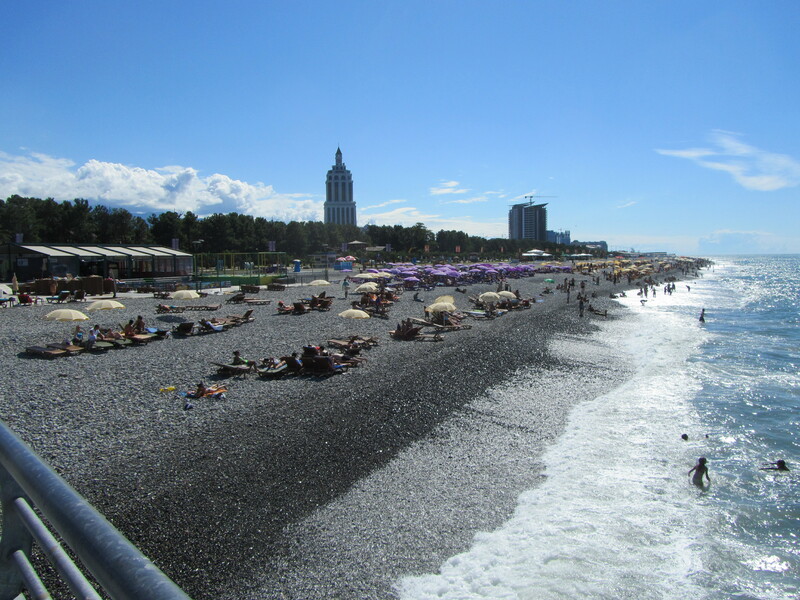 The Black Sea beach in Batumi on a beautiful, early September day. Time to make some changes in the house! Putting an extension on to the small kitchen area . The kitchen underwent some expansion starting in September. 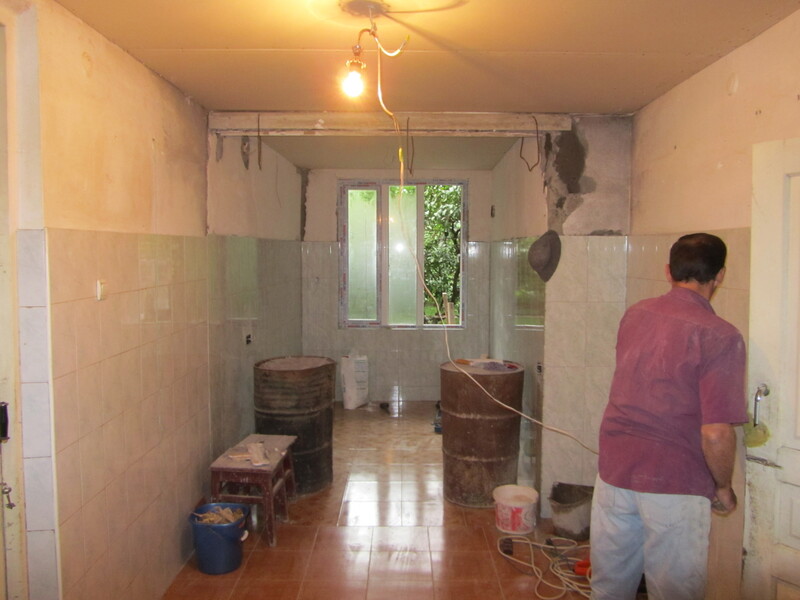 Two construction workers were employed to break out a wall and add 10 feet to the existing small room. The turmoil of this project was felt throughout the house (except our room upstairs) as furniture and rugs were moved and who knew where you would be sitting for your next meal? Luckily, everyone took it in their stride and accepted the upheaval. The workers were fed generously by our host family and we often sat at table with them. This is the “Georgian” way to treat workers in your home (as well as any and all visitors). 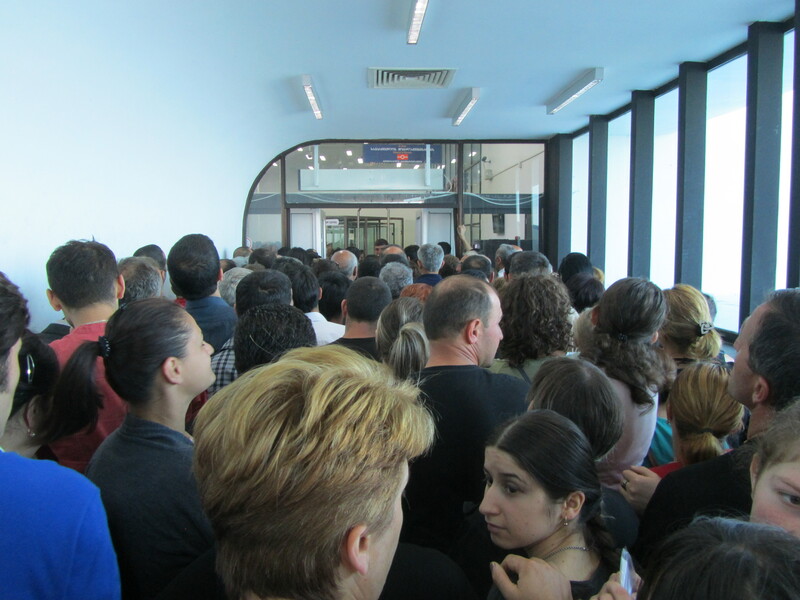 Waiting in the morning crowd to pass through customs into Turkey to shop at the Hopa bazaar. We didn’t make it as no one told us we needed a Visa! We’ll try again. 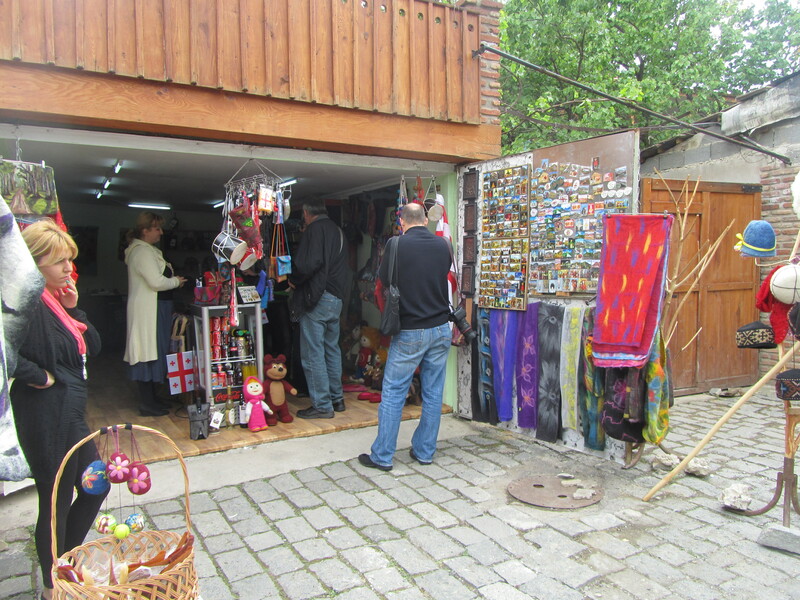 We finally found a Saturday when we could go to the Hopa bazaar in Turkey with our host ‘son’ Aleko. 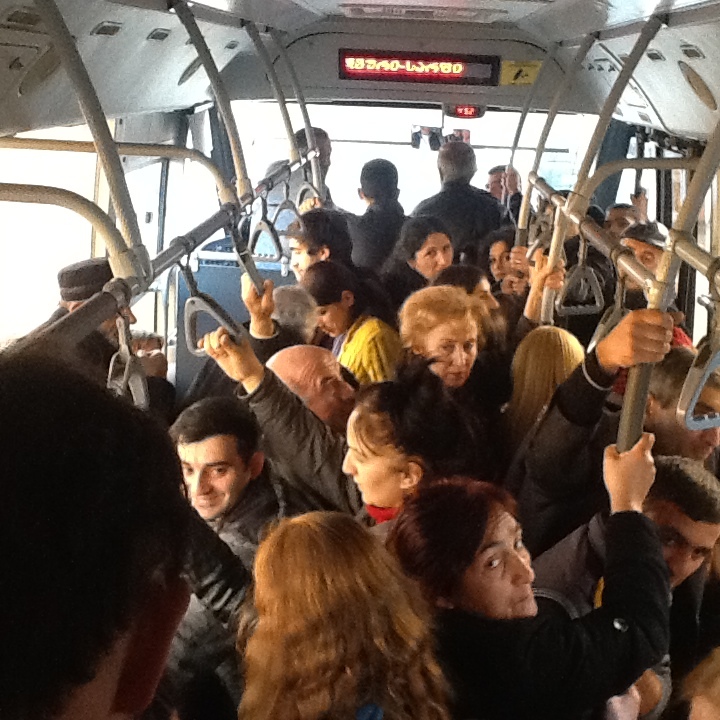 We boarded the crowded bus for the 10 minute bus ride to Sarpi, the border city, where we fell into step among this crowd. After about 20-25 minutes of moving slowly forward we reached a point where we were asked for our Visas! What??? No one told us we needed a Visa! At that point, we separated from Aleko to go home while he continued his journey to find his treasured items. Who knows when we will attempt to go again but now we have our Visas and are ready when the time comes. A mighty storm brought this trauma to our house. 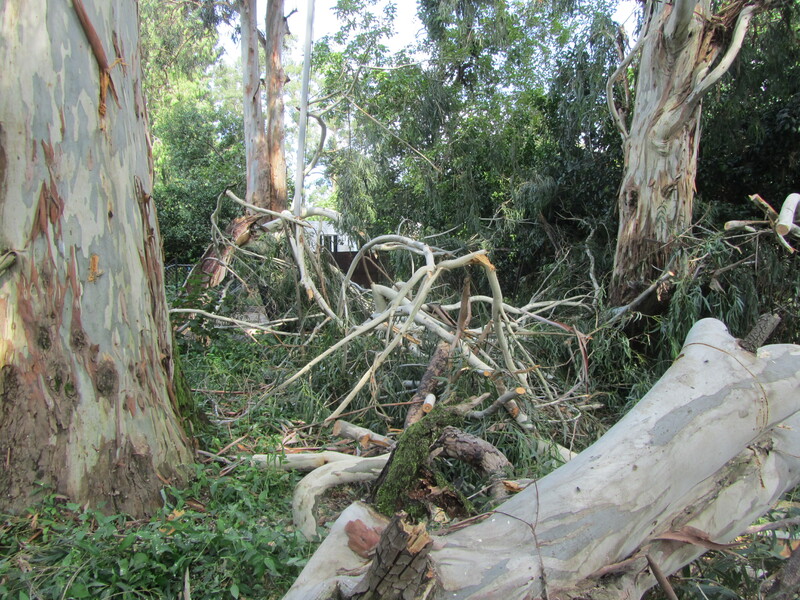 Eucalyptus trees devastated by a storm in front of our house and damaging a neighbor’s property. 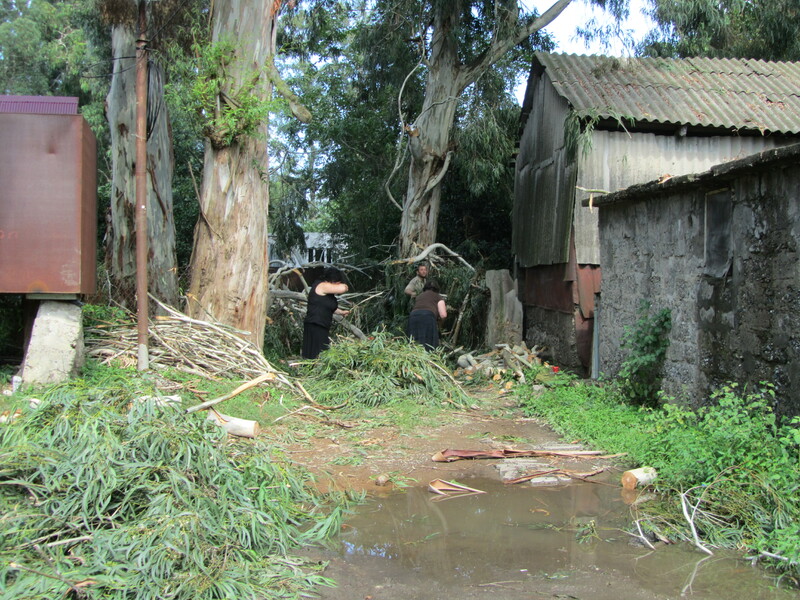 Clearing the dirt road in front of our house after the storm which harmed several enormous eucalyptus trees. By September, gathering wood for the coming winter is almost too late. Most folks start that process earlier. However, if you are just going to buy it, instead of doing your own chopping, you can find it in abundance along this street where truckloads are stacked every day. The gathering of wood for winter heating on a major street in Batumi not far from Tom’s workplace. Typical apartment buildings in the background with their wash hung out to dry. 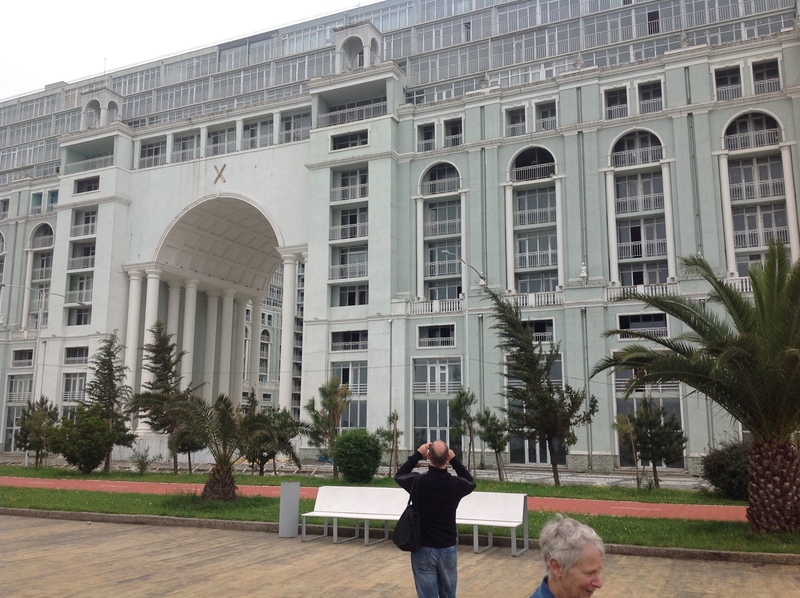 In the background you also see one of the tall, Russian built apartments so prevalent in Batumi. And here is another just feet from a very congested intersection with no traffic lights. Not many play areas for the little ones or the teens. 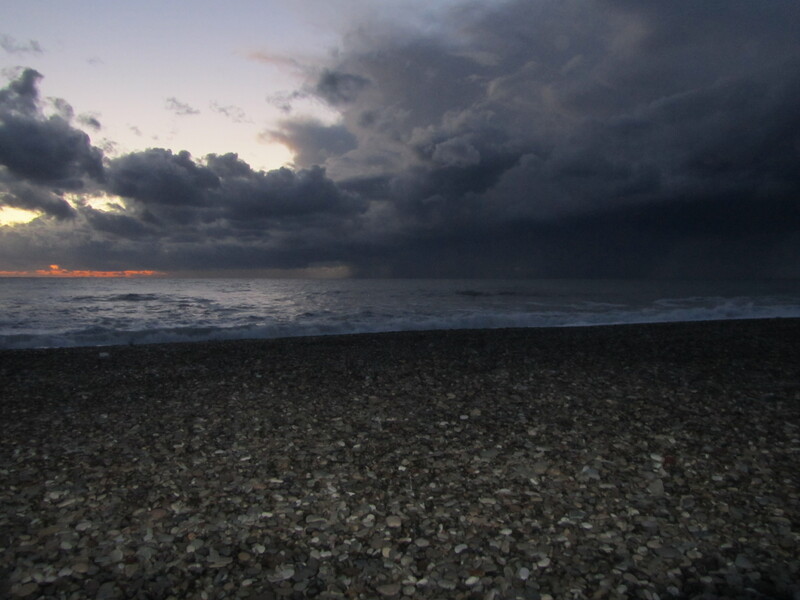 October storm clouds blocking the sunset over the Black Sea. 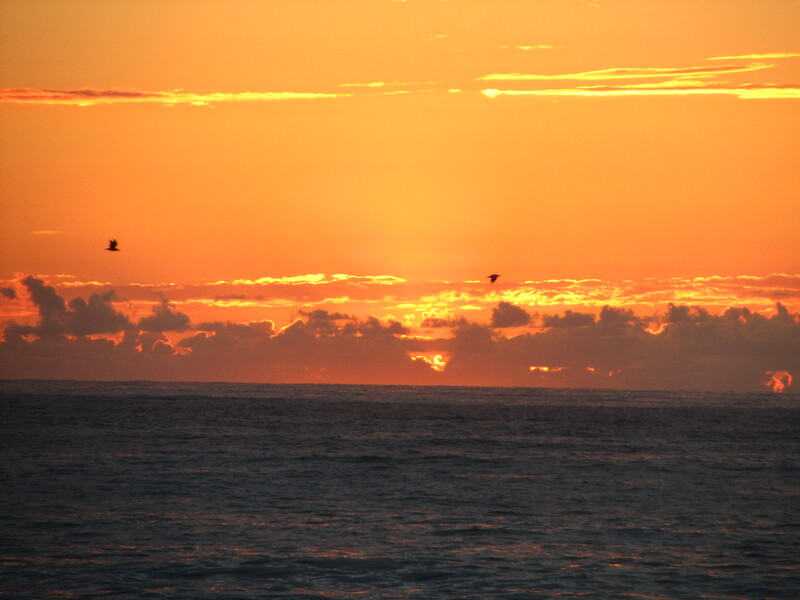 An October sunset over the Black Sea. 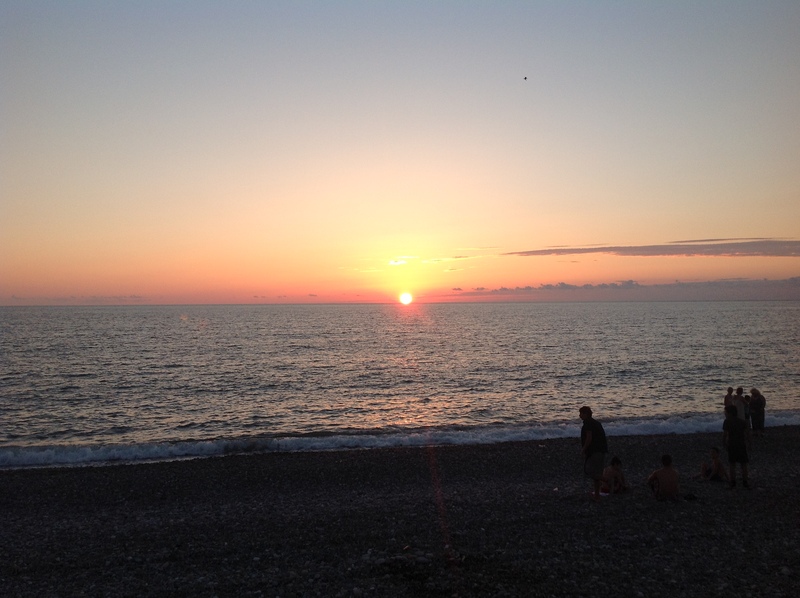 Sunsets will be one of our fondest memories especially as we viewed them by the Black Sea. Here is the contrast of a brilliant evening sunset with one that is awesome and threatening a storm. Walking the rocky beach at night is always a relaxing and reflective time. 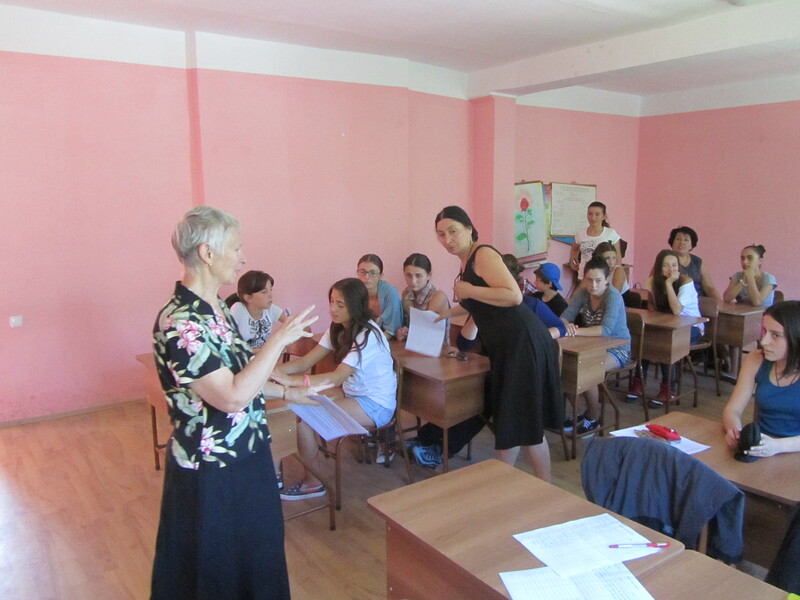 Suzanne doing a presentation on the National English Spelling Competition at a school in Kobuleti. The NESC (National English Spelling Competition) is in its 2nd year having been started last year by a most clever and original PCV, Adam. 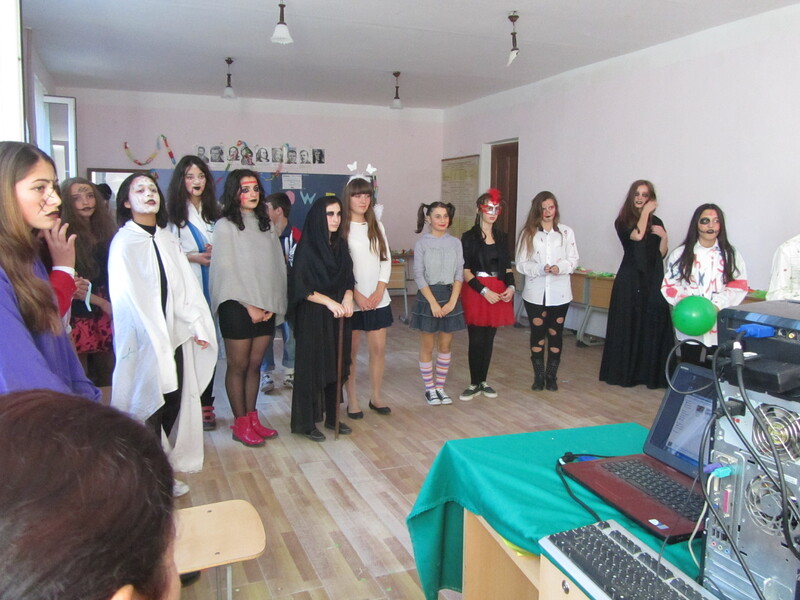 In this picture I am preparing students and teachers at a school in Kobuleti with the rules for this competition. I am the Regional coordinator for the Ajara region schools and this was one of my duties. The Georgian students LOVE competition of most any kind and spelling is no exception! We’ve had a big increase in schools that are participating this year. Round 2 is in December and the final round in March. That will take place in Tbilisi, the capital. Getting ready for the National English Spelling Competition…first round in the local school. This is one group of students in my school getting ready for the first round competition. One of my counterpart teachers, Neli, is standing in the back of the room. 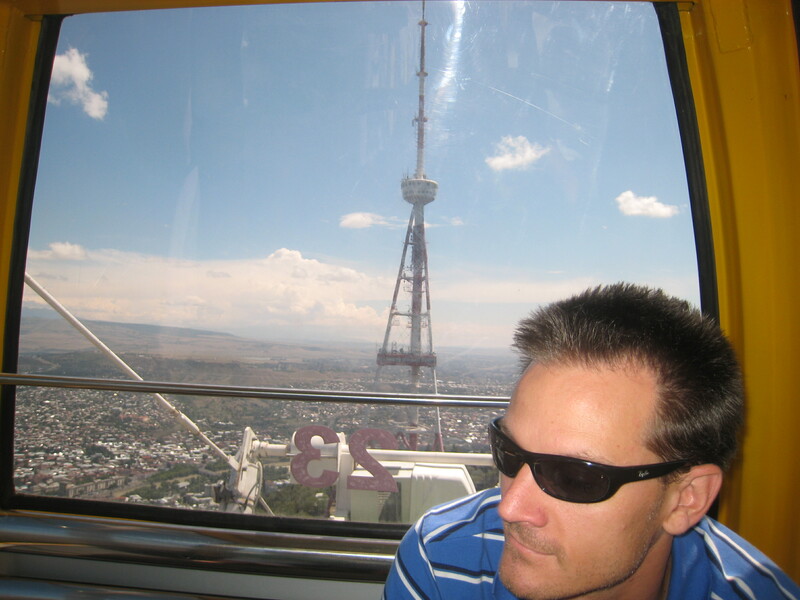 A ride on the newly built Gondola in Batumi which allows a full view of the city at the top. 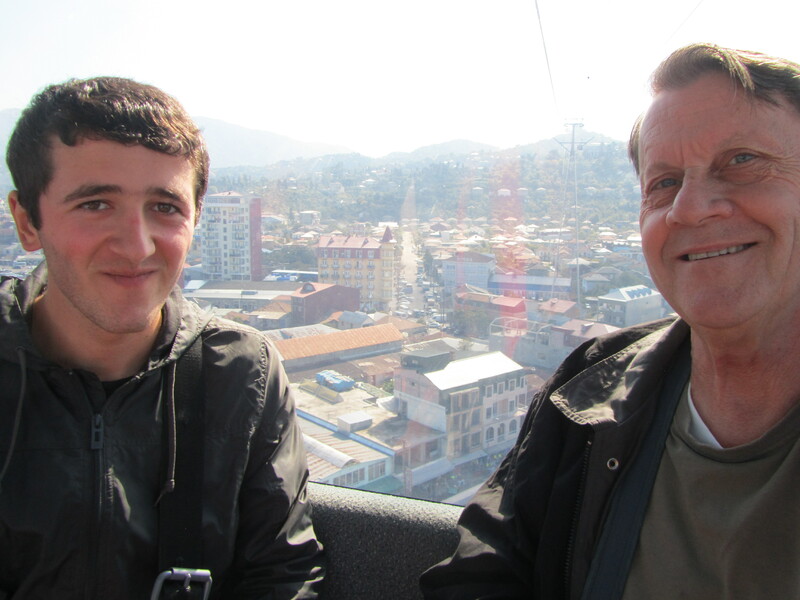 One of the newest “things to do” in Batumi is a Gondola ride up the mountain for a full view of the city. Tom and I took this ride on a nice sunny day in October. A few weeks later, Tom took our host brother, Aleko, up for a ride. Eliso, our host sister, preferred not to go. Looking down the street from Heroes Monument toward the snow-capped Caucasus! Notice the lovely palm tree on the new boulevard. They grow quickly in this sub-tropical climate. 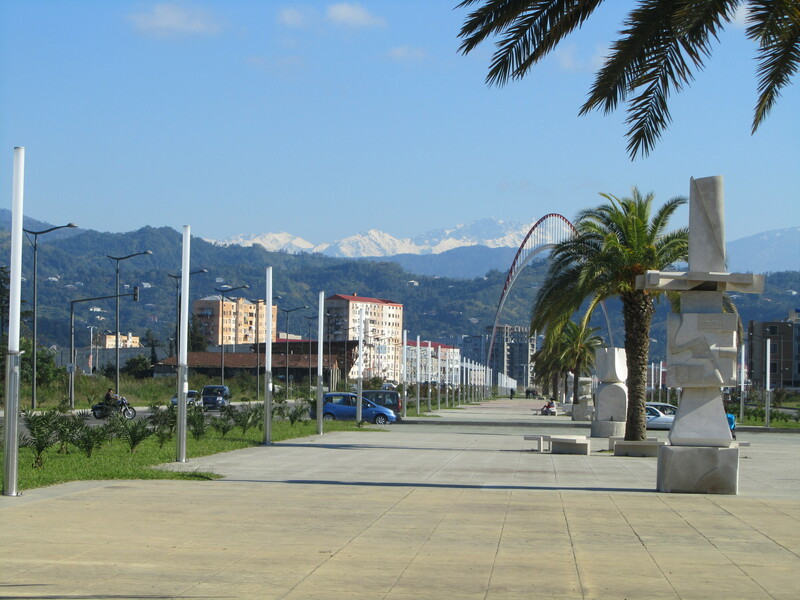 This is a view of the snow-capped Southern Caucasus seen from one of the wide boulevards in Batumi. An awesome, beautiful site in mid-October. In contrast you see me walking to school from our house after a heavy rainfall. The dirt road has no drainage and you must maneuver carefully to get through with dry feet. I consider my ‘duck’ shoes as one of the most valuable items I brought with me to Georgia. Suzanne off to school on the dirt road off the highway. It had rained as you can see and there is no drainage for the water. (2603/2608) Halloween isn’t celebrated in Georgia but the more the kids hear about it, the more they want to have fun with it. So these pictures are from a presentation I did in the Batumi American Corners library to talk about the holiday and have also have some fun. 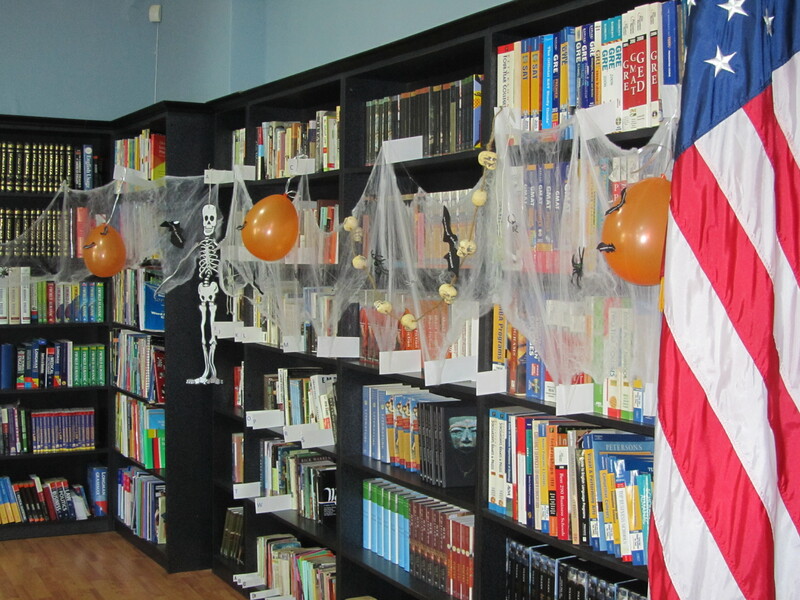 Salome did a wonderful job decorating the Library for Halloween. When I arrived there was already some serious face painting going on. 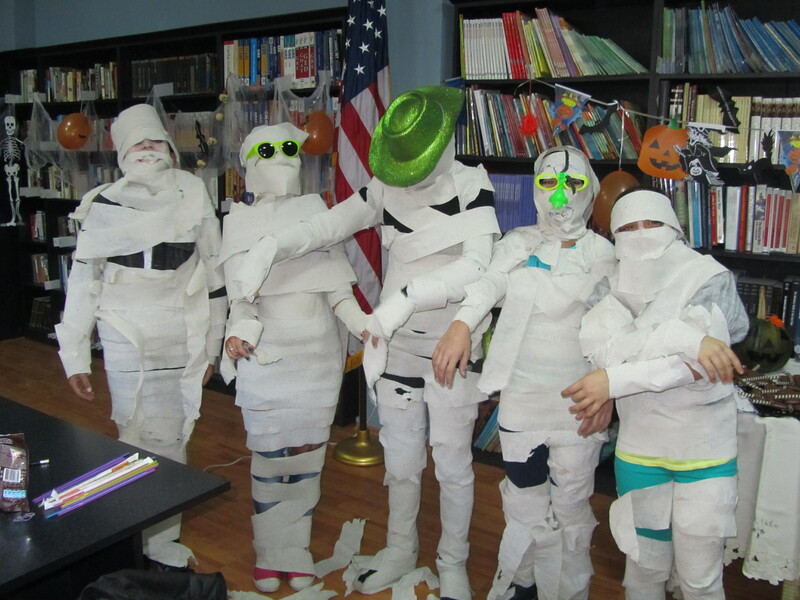 We played some fun games, had them taste some “candy corn” and ended the day with a contest to make mummies with the rough, brown toilet paper used here. There was unanimous fun that day! Some costumed girls at the Halloween party for the 11th grade. 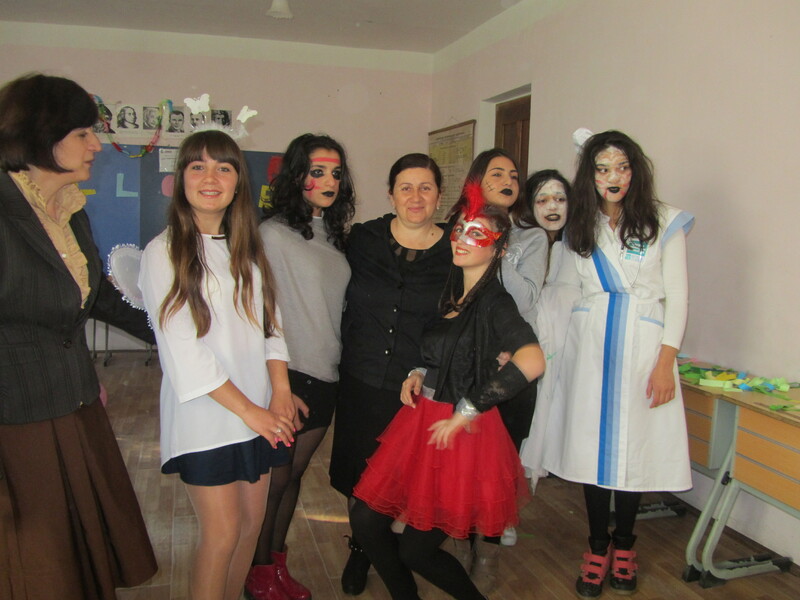 Halloween with some students and two teachers! More Halloween antics at my school where they had a party that was mostly girls and didn’t have any food! Throwing a party needs some work here, I think, but everyone did enjoy some fun! As you all know by now, Turkey is our southern border (mostly) and as a result there is a percentage of Muslim folks who have flowed over into Georgia and especially into our small village of Gonio. One day a few weeks back I was told that the Muslim children wouldn’t be in class the next Monday because of the holiday of Eid Al-Adha. On this day, many families will slaughter a sheep for their celebration. This picture is our neighbors home where they are following this tradition. Tom took the picture….naturally. Our neighbors celebrating the Muslim holiday of Eid Al-Adha by killng a lamb for the evening feast. Tom opens a goodie box from friends in the USA. Maybe we shared some? 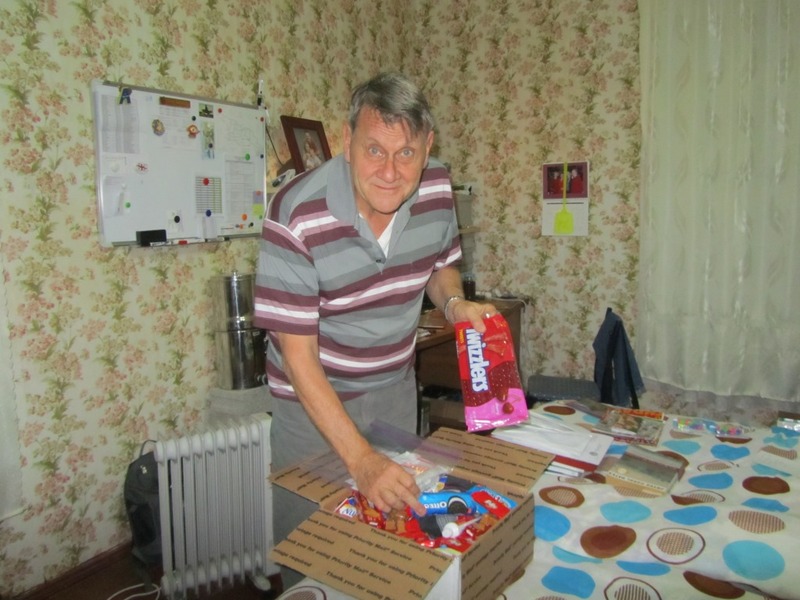 here is Tom opening and examining a “goodie” box from our dear friends in Aurora, Colorado. They know us well and included items we like but that are unavailable anywhere in Georgia. These boxes receive great reverence and the contents are used with some solemnity due to the love that sent them. We even dubbed them “the love boxes”. We close this post with a short video where Suzanne is walking from our house out to the main road. You can see what a mess we have when it rains! Day 1. 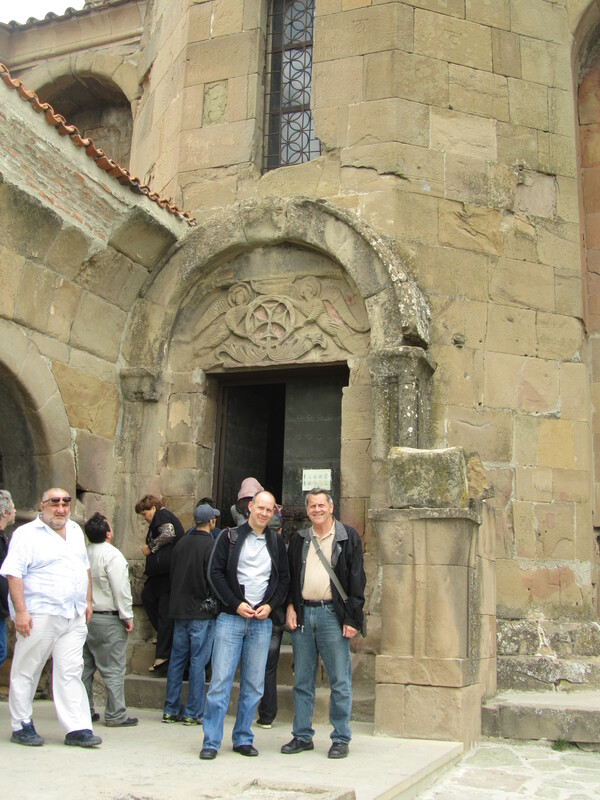 We started on Saturday, August 24, leaving early to get a marshutka to Zugdidi, our first stop. In a few hours we arrived along with the rain. 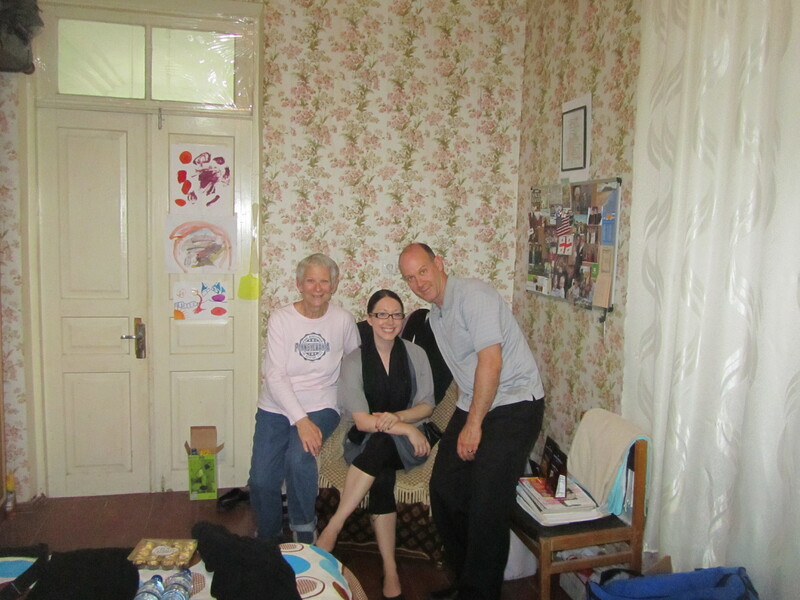 We had arrangements to stay in a Guesthouse that night and our hosts were nice enough to come pick us up. After settling in the rain had stopped so we ventured our to explore the town. Our first impression was that it was so clean! There was one main road through the town and we spent most of the afternoon walking. We stopped at a local café for a pizza which had, of all things, pickles on it. There was a Smart store in the town and we headed there for some extra food supplies. to our amazement, they had some microwave popcorn which we purchased and enjoyed that evening. A Skype message from Costa Rica caused us to hustle back to our lodging for a visit with Stephen, Dana and the boys. Not sure the type of tree this is but the shape was really different. Day 2. It rain through the night and was continuing as we got ready in the early morning. Again our hosts were very considerate and gave us a ride to the next marshutka stop. We rode around the small town for about an hour til the marsh was full of passengers and got underway. Traveling to Svaneti is a most picturesque ride through the Enguri valley following the Enguri river. Mountain views were very reminiscent of our own state of Colorado but the roads were several centuries older! 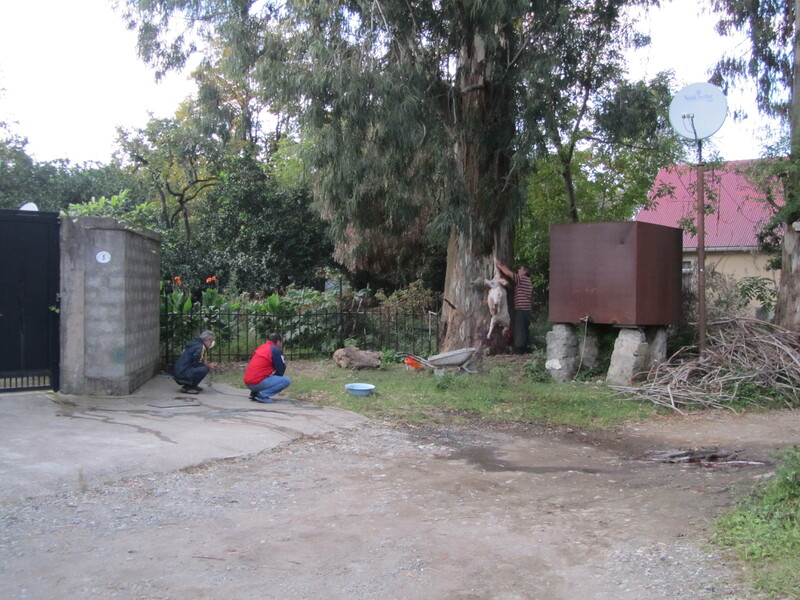 We arrived in Mestia in several hours and connected with our guest hostess, Rusiko, who took us to our guest house. It was up a very steep, cobblestone road and we were grateful to have a car help us. Suzanne making the long climb to our guest house in Mestia. Day 3. Destination: Ushguli, 7000+ ft. Ushguli is comprised of 4 very small villages but they are close enough to walk to all of them. 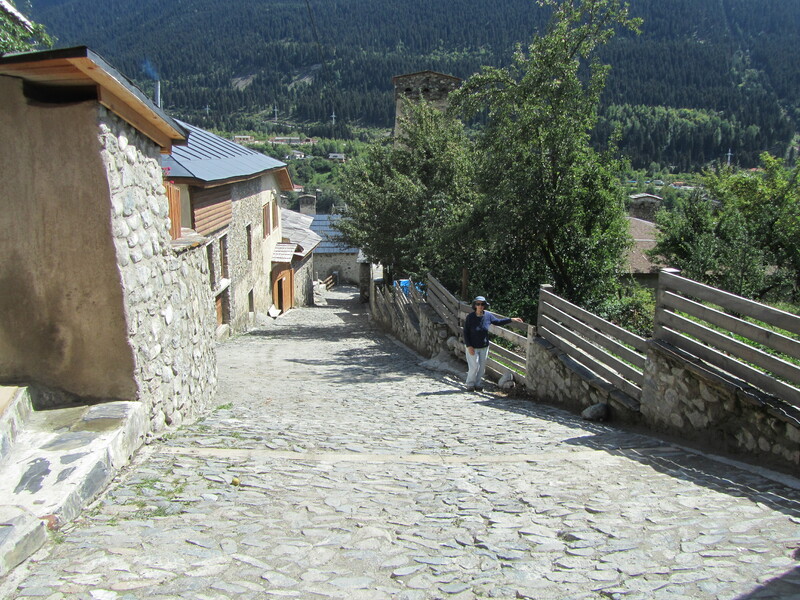 Ushguli’s claim to fame is a belief that it is the highest continuously inhabited village in Europe. As we approached the first small village I could see no life and thought it looked like a ghost town. A little bit down the road we pulled into the 2nd village where there was the obvious movement of people and various animals. We spent the next 4 hours trekking through the village and meeting its many interesting inhabitants. First stop, however, was a very small window where some items of food and drink could be bought. We had some lunch which our hosts had prepared for us so we bought a drink and took in the atmosphere around us. It is quite impressive and breath-taking. Our walk through the village was eventful for the numbers of animals that roam freely including cows, hairy pigs, horses, chickens and sheep. But more interesting were the people. Most seemed very old although we know this way of life ages a person more quickly than city living. We chatted with a man who was a woodcarver and had some of his wares on display along with some items made by his mother (or mother-in-law) that were woven. We purchased a few things there. And then as we continued our walk we stopped to chat with a man sitting on his steps and on the door of his house was a sign that read “Museum”. At his urging we entered and found an upstairs room filled with memorabilia which included all kinds of articles from newspaper clips to full grown stuffed mountain goats. It seemed something like a personal timeline of his life… homey, quaint, interesting and funny. As we talked, or I should say ‘communicated’, he took a Georgian instrument called a panduri from the wall, sat down and started to play and sing a Georgian folk melody. It was a most lovely moment both intimate and generous. We knew we were experiencing a few moments we would never forget. After that we learned that he was 70 years old and his wife 68. Gently we parted ways with them and continued our walk up the mountain to see the new little Orthodox church that was under construction. “The hills are alive with the sound of….” silence mostly, but the beauty of the setting could make you want to sing. Such a vast expanse of scenic beauty and the pastoral nature of the village left us quiet in thought and memorizing these scenes for the first and probably last time. 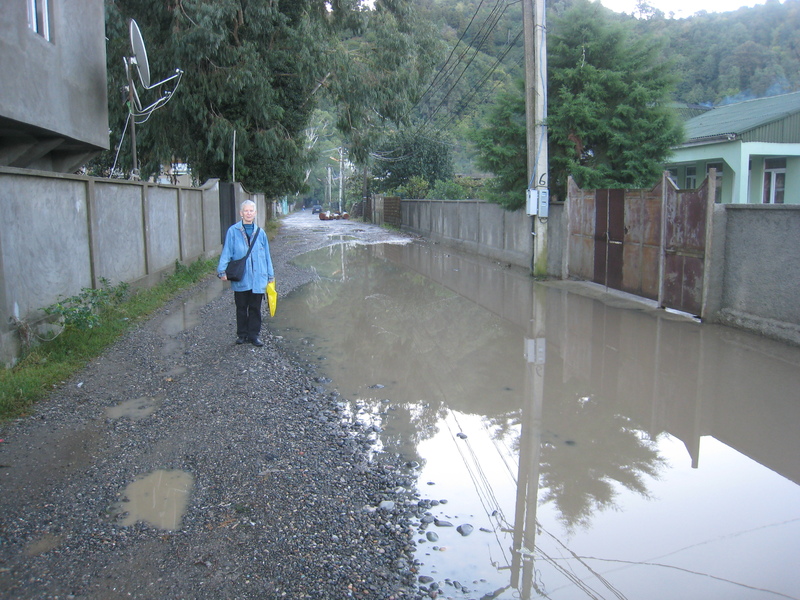 Day 4: Our last day back in Mestia was less ambitious. We walked the town again and finally did get to visit the beautiful Museum of History and Ethnography. The rich history of the Svans is present in many artifacts that had been stored safely in private homes for hundreds of years. Among the most impressive for us were the beautifully illuminated gospels dating from the 9th to the 11th centuries as well as golden crosses and icons dating from that same period. Later we sat in the park in the center of the village and, while Tom napped on a bench, Susan, Eka and I talked about our life in the schools to which we would soon be returning. We also did some souvenir shopping which provided me with a nice jar of local Mestia honey. Early to bed that night and ready for an early morning departure on the marshutka. Mestia with a view of the new modern police building in the town center. One of the many artificial lakes created for power production. This cow is pulling a sled-like device but there isn’t any snow! Which Christmas tree shall I take? The Svaneti Ethnological Museum located in Mestia, Georgia. Tom takes a nap in Mestia’s city park. Tom dancing in front of Georgia’s highest mountain – Mt. Shkhara (17,040 ft). Mt. Shkhara. 17,040 ft is the third highest mountain in the Caucasus’. Russia is on the other side. This way to the top! Time for a potty break! The road is starting to disappear. Cars are backed-up as we wait for the slide to be cleared from the road. Watching the raging water rush down the mountain. You can see how badly the road was damaged by this slide. Really there wasn’t any road! Sitting in the Marsh waiting for the road to open. One of the towers holding the power lines, like the one in this picture, was pushed over into the ravine by the landslide. The river was moving very fast through one village we stopped at. Many building falling into disuse! Locals sitting in Mestia central park. Scrolls that rival the Book of Kells. Where has the road gone. Suzanne really like these for Christmas. The cows take a break. Careful, you might get butted by this guy! Off we go on our search for the Church. PC Volunteers in front of the schoolhouse in Ushguli. Suzanne in front of the lover’s tower. FInally, a picture with the two of us. We waited until the road was open. Look at all the gray silt at the bottom of the small creek. This is a tall tower. Tom went to the top. A view from our room. Suzanne went up to the first floor. In the top room of the tower. 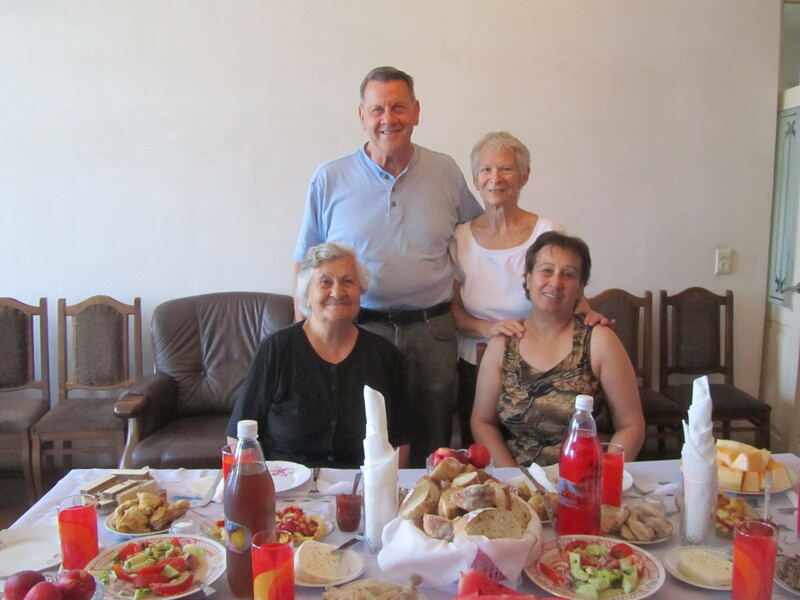 We had filling meals at the guesthouse in Mestia. Bubble, Bubble, Toil and Trouble. This is really a pot filled with jam. Mestia from a bridge overlooking the river. It’s hard to believe that July has come and gone. It felt like only yesterday Tom was in Khashuri, on July 1st, participating in a discussion panel with the new G13s during their Pre-Service Training. Then, very quickly we were both in Tbilisi, July 15th, attending their Swearing-In ceremony and wishing them luck in their new assignments. 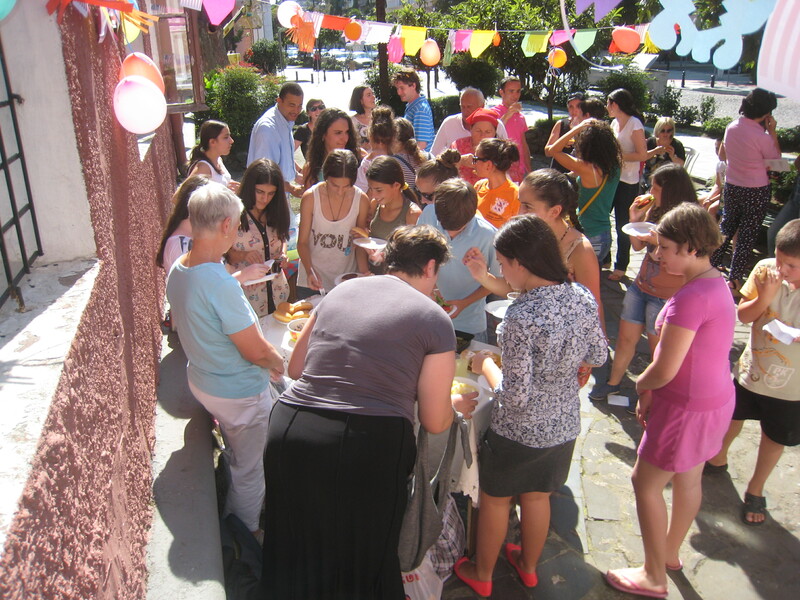 We followed this with a gathering of members of our own G-12 group to celebrate our 1st year of service. It was a memorable day all around. Group 13 and their program managers. Those brave souls who made it to the one year gathering plus Sarah’s brother. 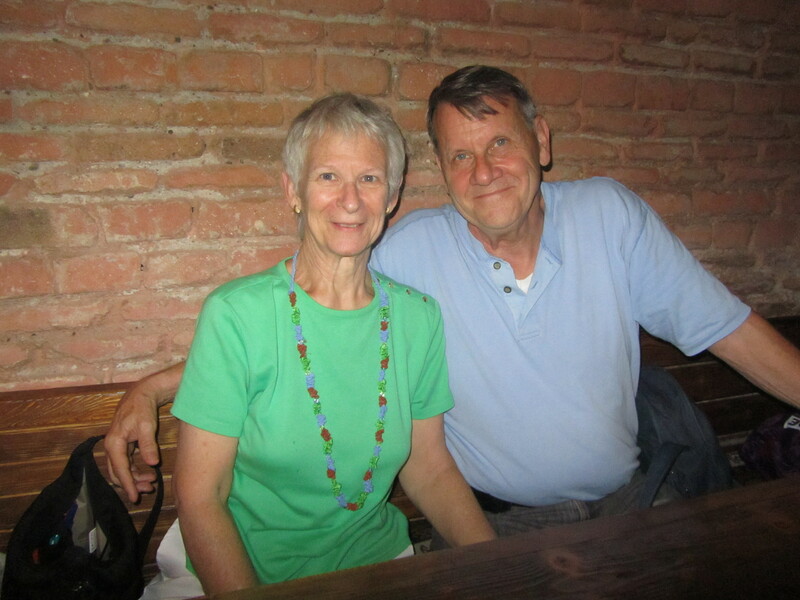 Suzanne and Tom at our one year celebration. 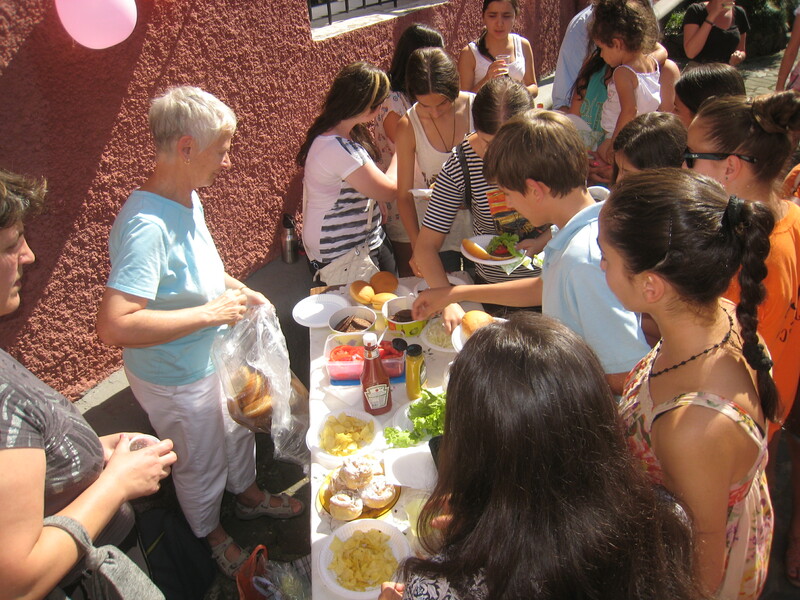 During the first weeks of July, Suzanne had the opportunity to teach English conversation at a private English school in Batumi. This was a great experience and very different from her normal public school. 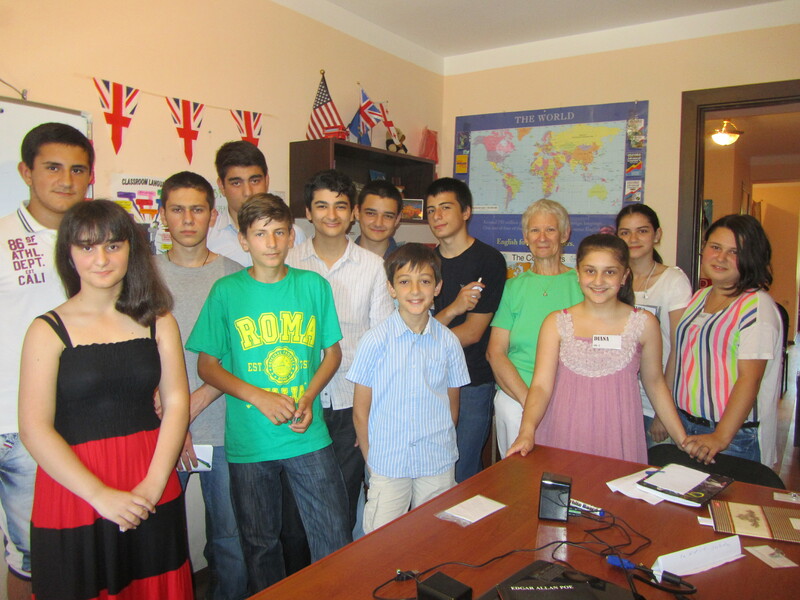 One of two summer English classes Suzanne taught in Batumi. 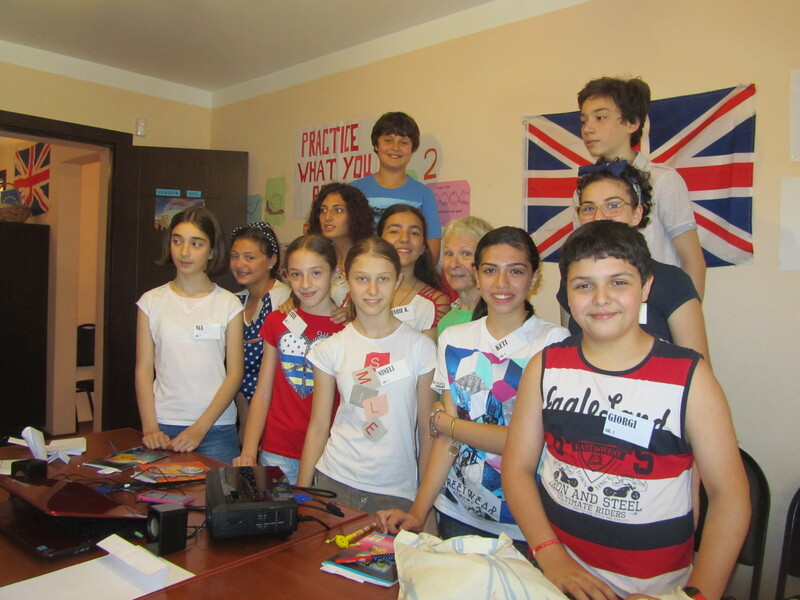 The second of two English classes Suzanne taught in Batumi. Well back to our story. No sooner had we gotten back to Gonio when Tom chipped a front tooth. He was not sure how serious it was and was going to let it wait for our dental check-ups in September but our Peace Corps doctors insisted he have it taken care of ASAP. So we were barely home one week when we were off to Tbilisi again. Good thing too as the tooth needed more than just a polishing. Tom and his new friend the dentist after she fixed his chipped tooth. Suzanne tagged along for the dental visit, (she really loves the dentist, NOT)! She came because Stephen, our youngest son, decided he could swing by for a short visit after he finished up some work in Geneva. This was a nice surprise and we were really looking forward to his visit. Stephen in Batumi by the Black Sea. Several years ago Stephen was in Georgia along with Dana and he was looking forward to seeing the Western side of this country. 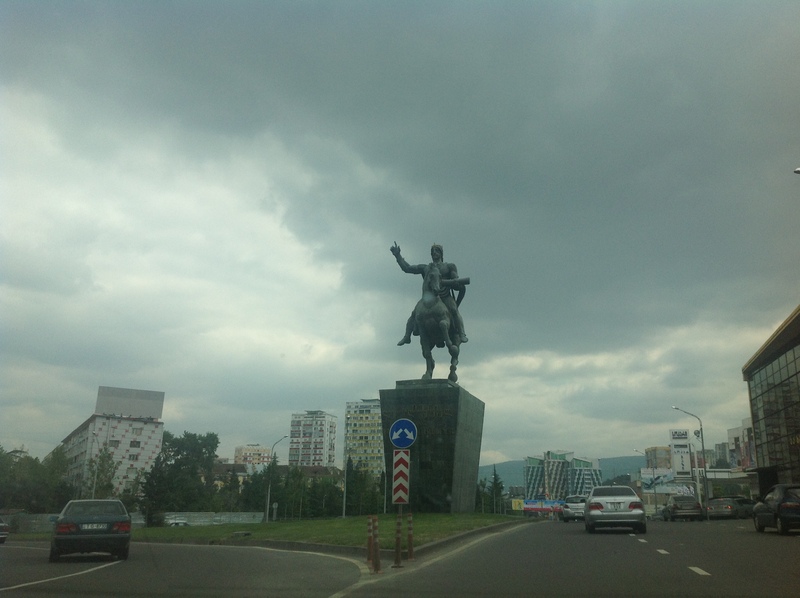 During his first visit their time was spent in the East in the regions near Tbilisi. 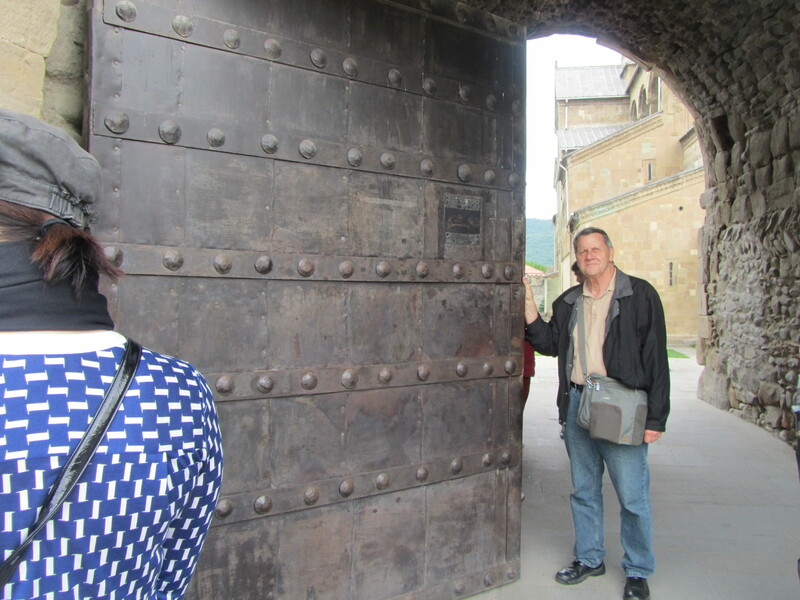 Stephen also wanted to re-connect with several graduate school colleagues he met and befriended when studying at the Central European University in Budapest. So to say the least his days here would be filled. 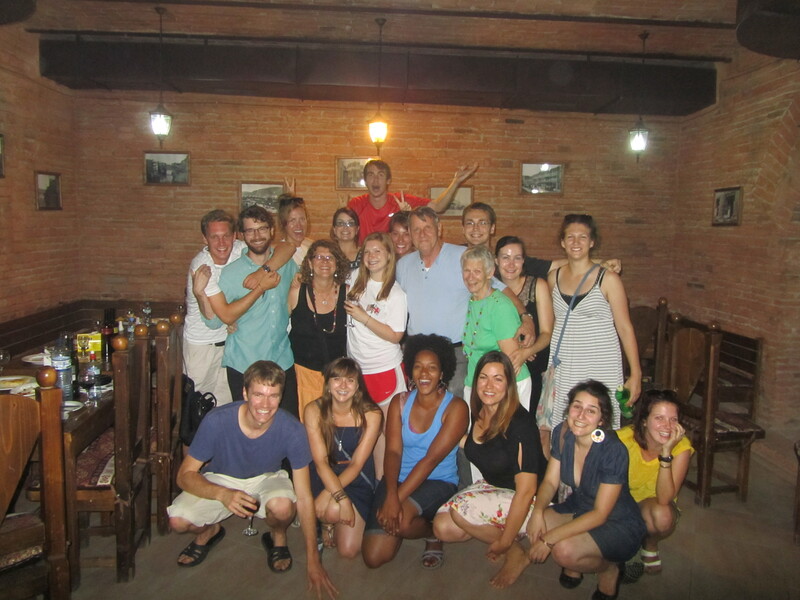 We met Stephen at the Tbilisi airport at 3:30 AM on Saturday July 27th, took a cab to the Peace Corps office and stayed there until 6 AM when we left to catch the 7 AM train to Batumi. We talked a lot and tried to sleep some but the excitement of having him here did not help us to sleep. 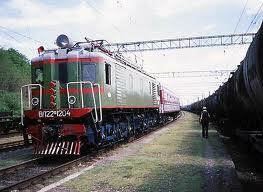 These were the first 2 of 4 train rides for us in just 4 days…..a plan we hope not to ever repeat. 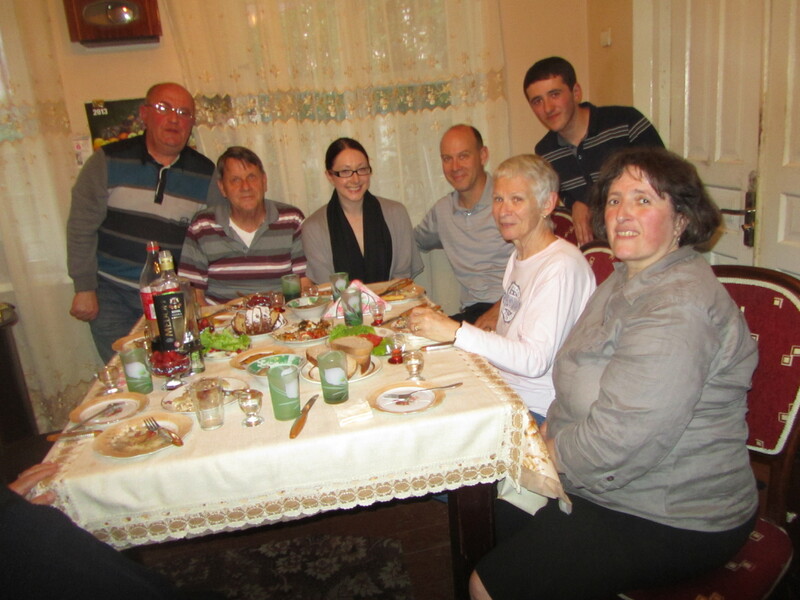 We arrived at our village about 1:30, got Stephen settled and had a meal with members of our host family. Our host dad was off on ambulance duty and could not join us until the next day. The rest of Saturday was spent walking around our village and our sea-side boulevard. That evening we were on the night train back to the capital. 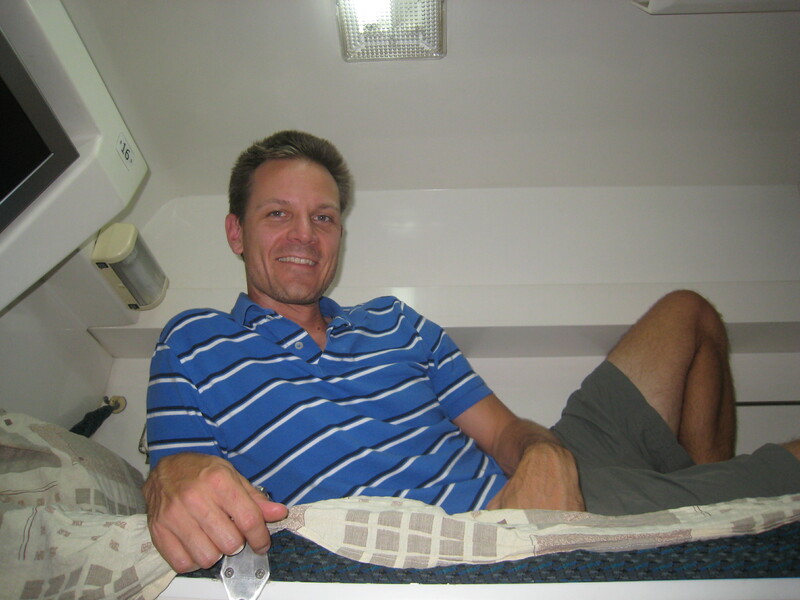 We had a cabin with 4 berths and the youngest member of the family got the top bunk. After a very relaxing breakfast at the Holiday Inn (a lovely treat) we were guides showing Stephen some of the fun spots of Tbilisi. 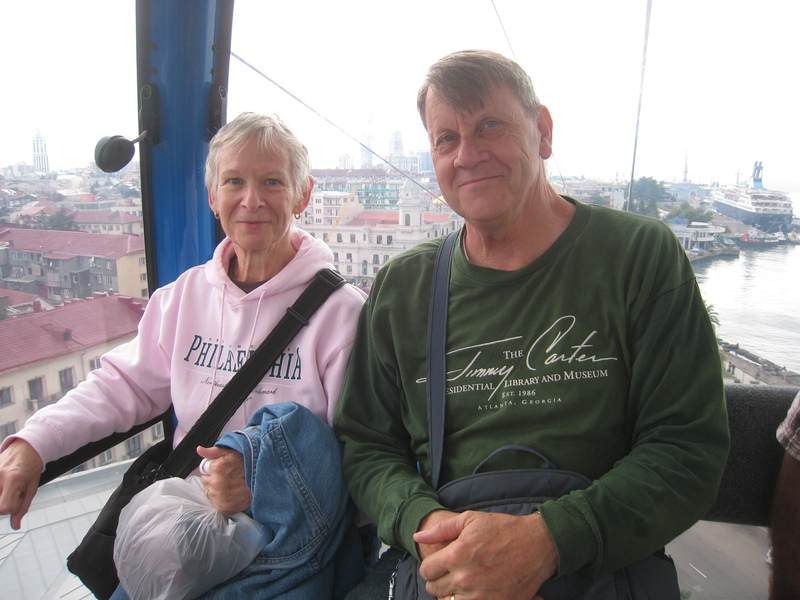 These included the Funicular ride up to the top of the city and a Ferris wheel ride with spectacular sights of the city. Our next meal was Georgian food across the street from the PC office. One of our PC staff, Sue Miller, had worked with Stephen many years ago in Washington and this was a reunion of sorts which we were glad to arrange. Delicious food, good conversation and friendship….you just can’t ask for more. 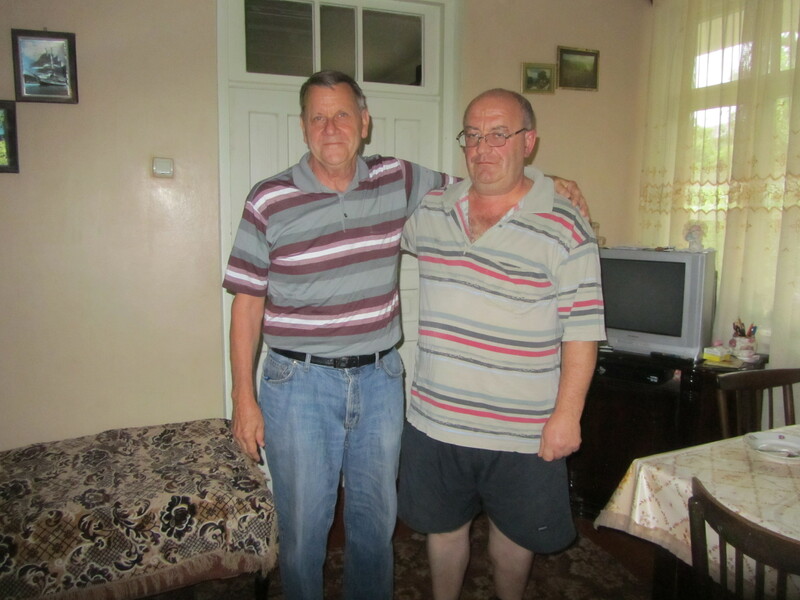 Then in a short while, Stephen’s friend Otar arrived to take him for the evening to share with mutual friends from their Budapest days. A quick good-bye and he was gone while we began our trek back to the train station for our trip home. A surprise awaited us as Tom’s Director, Levan, was sitting right behind us! Stephen gets the upper berth on the train ride to Tbilisi. 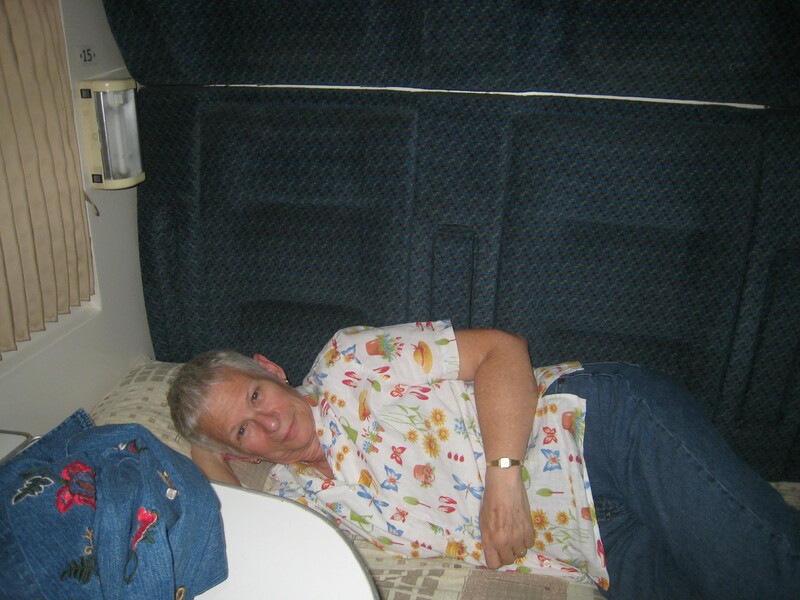 Suzanne takes the lower berth on the train ride to Tbilisi. On the Ferris Wheel high above Tbilisi. 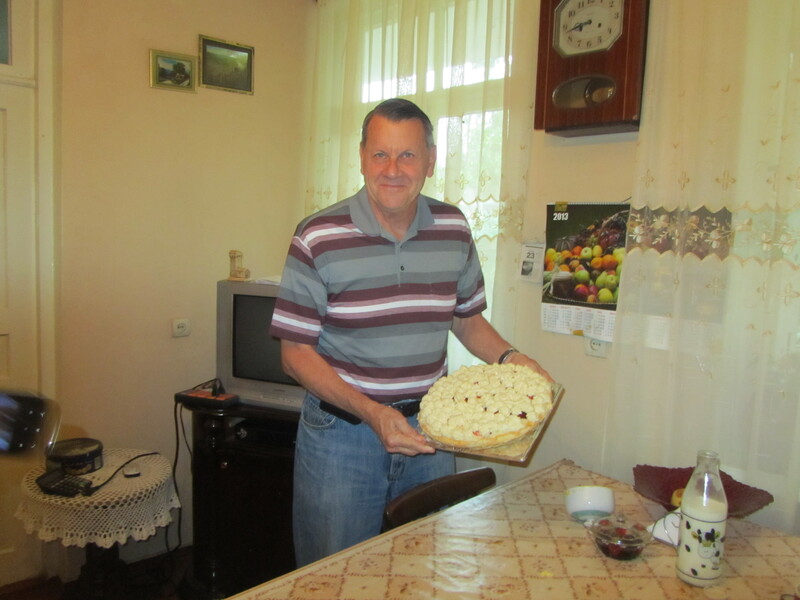 July is birthday month not only for Tom but also our host dad, Nodar. This was appropriately celebrated with the host family. Tom and host dad Nodar. Nodar’s birthday was July 23rd so he and Tom celebrated together. 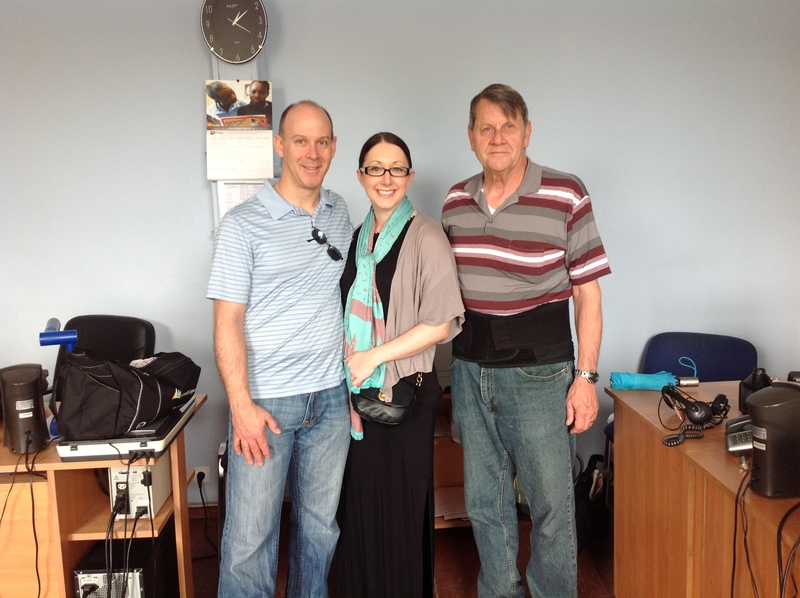 July also found the two of use traveling to our PST site, Telavi, and a quick visit with our PST host family. It was a good and happy visit but all to short. 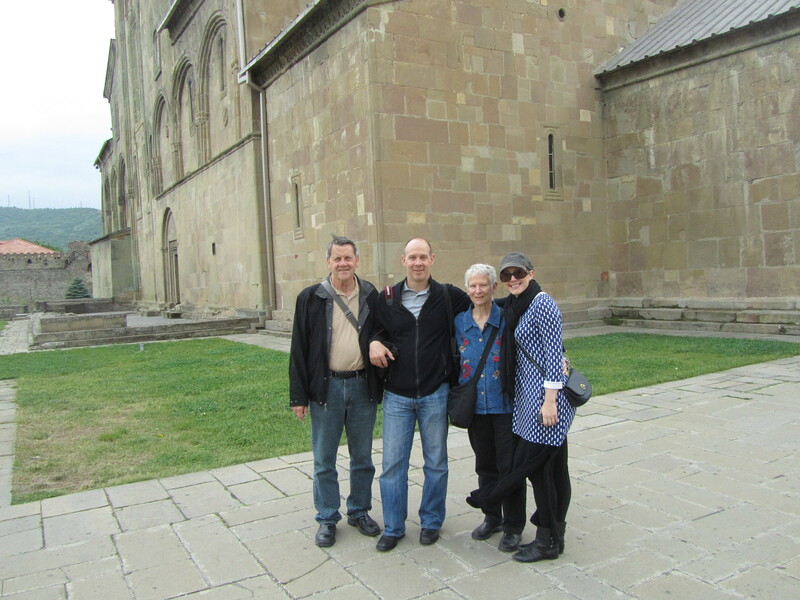 Nana, Nino, Tom and Suzanne in Telavi, Georgia. American Corners, a part of the Batumi Library and sponsored by the U.S. Embassy is a place we visit often and occasionally offer insights to American life. Suzanne gave a presentation about our Independence Day celebrations to a very interested group of Georgian Youth. 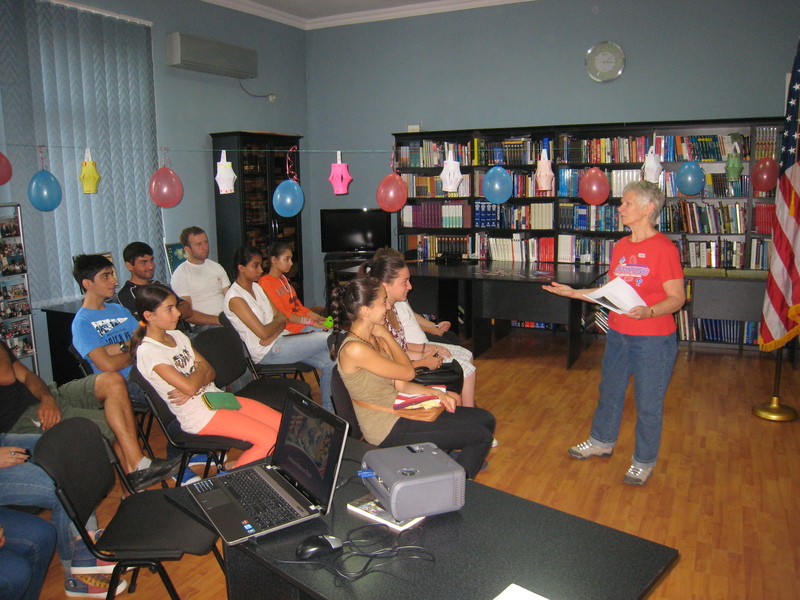 Suzanne at American Corner’s Library giving a 4th of July presentation. 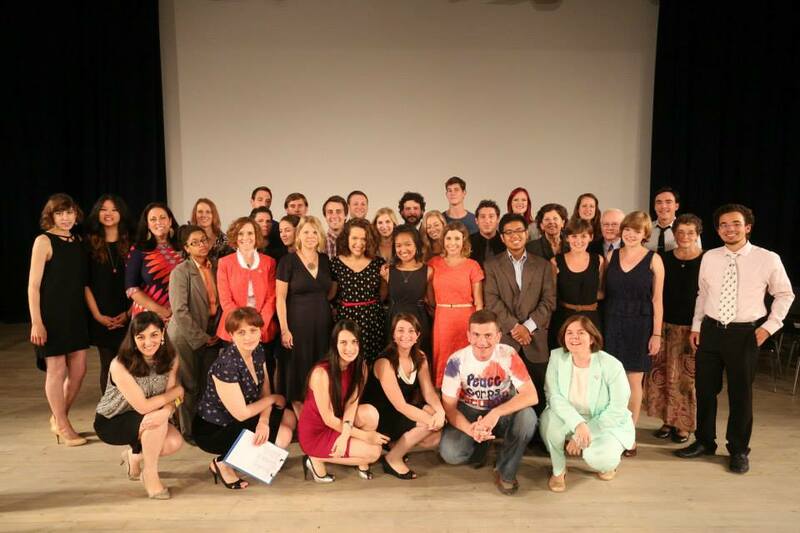 The month ended with us being a part of “Culture in the States”, another U. S. Embassy sponsored initiative to share American ways with Georgians. We opted for an American BBQ and are proud to say it was a great success. To help us out we got the local McDonalds to donate the hamburger buns and patties while we supplied the fixings. Summer BBQ at American Corners Library. More fun at the summer BBQ. We even made it on the local television nightly news! All in all July was a very busy but fulfilling month and we hope the next 11 will be the same. ბების ჭაჭა – Bebia’s Chacha. 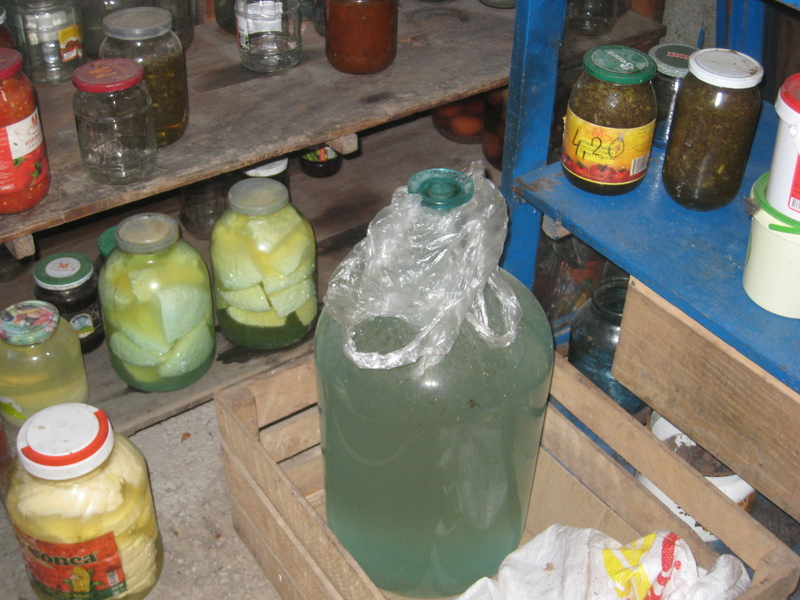 In previous posts we have mentioned the Georgian’s love for wine and for their home-made vodka called ChaCha. The purpose for this post is to give a first hand account of making ჭაჭა. 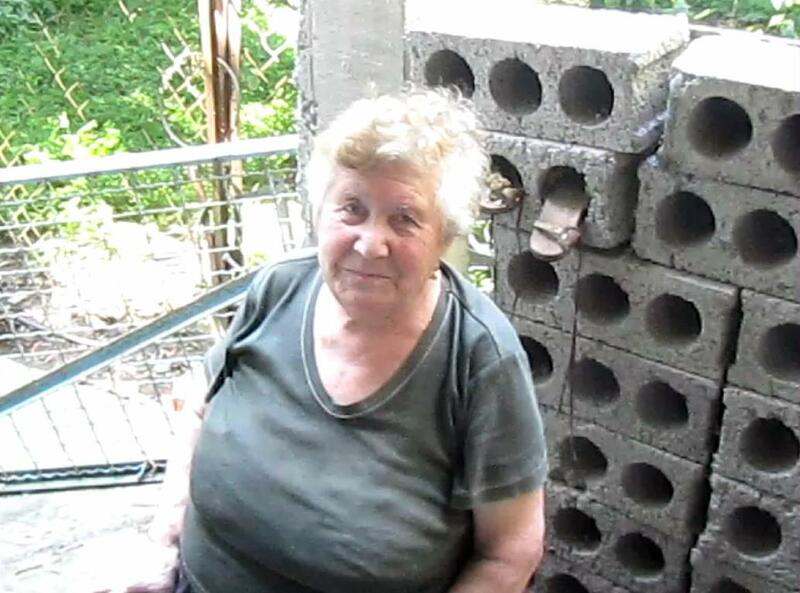 In our little village of Gonio, just 6 km from the resort city of Batumi we live with our host grandmother Margarita Kakhidze, an 84 year old retired Russian language teacher. 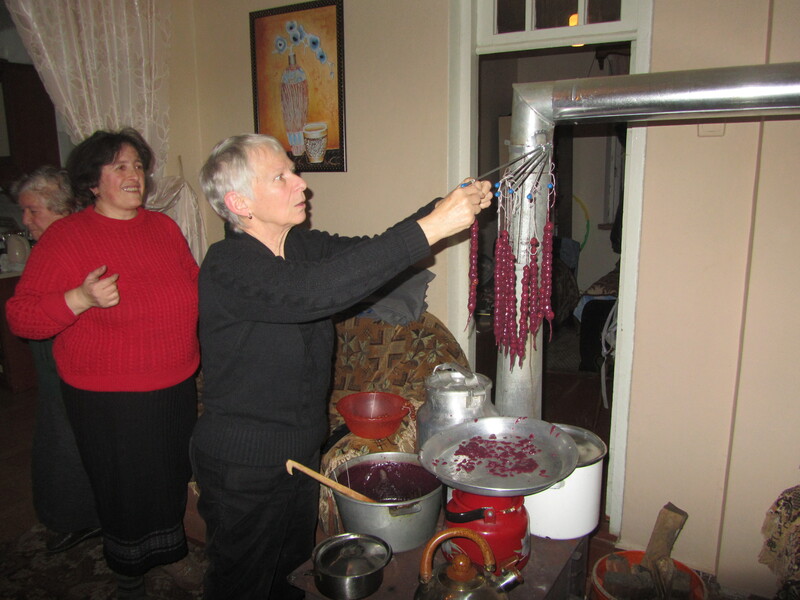 She is the matriarch of our host family and also the producer and keeper of the ჭაჭა. This is our Bebi, Margarita. From the Wikipedia article referenced above, you learned that ჭაჭა is produced from a variety of fruits. Ours comes from Mulberries harvested from the huge mulberry tree at the front of our house. Throughout Spring when the mulberries began dropping from the tree the family began the arduous task of gathering them all up from the ground. Some were hand picked but others were caught in large tarps stretched out beneath the tree. We experienced several days when the weather was really violent with rain and wind. This played havoc with the tarps, but I don’t believe many mulberries were lost. 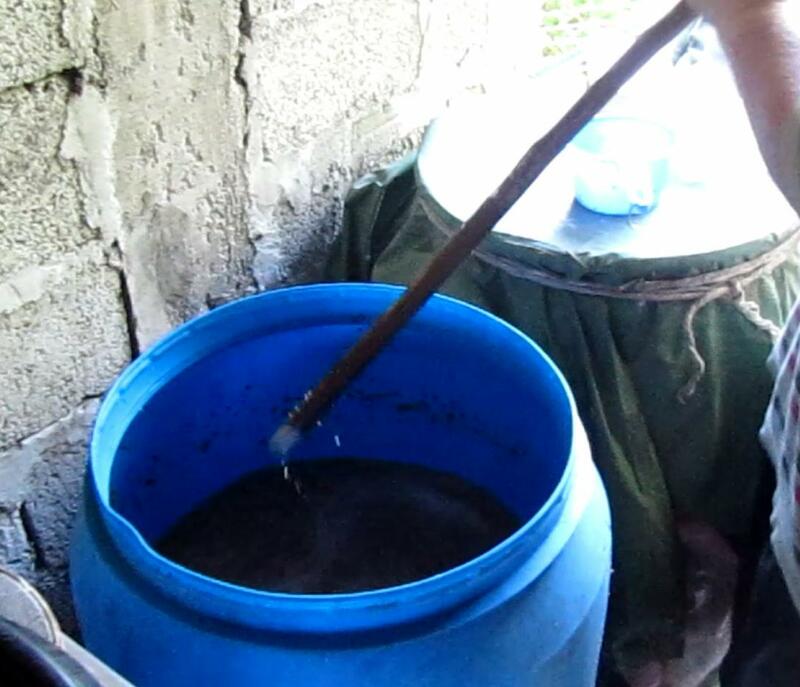 The collected mulberries ended up in two 500 liter barrels, that’s about 55 gallons each. 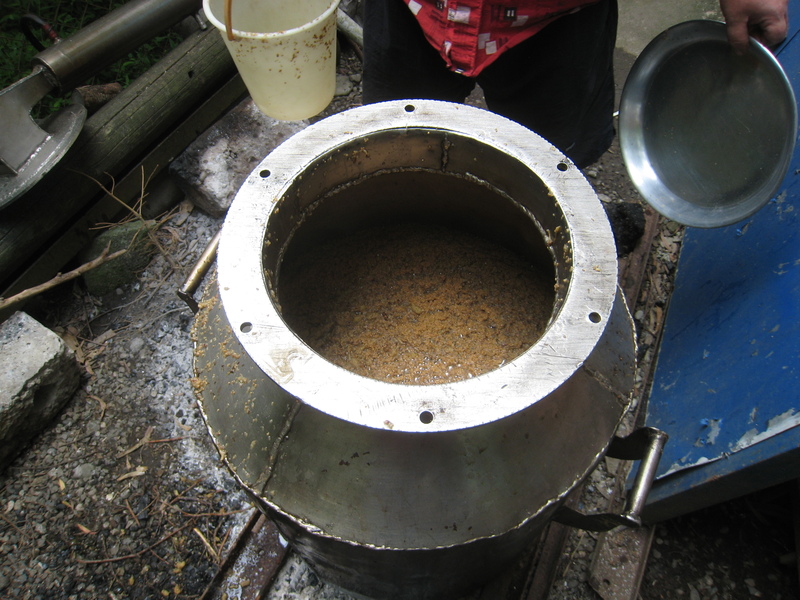 Water and whatever else is needed was added to this mixture and the “mash” was set aside to age. Last week we were sitting in our room reading or working on the computer when the smell of smoke began coming through the door. We weren’t concerned about the house being on fire since everything is make of stone. Our concern was what to do as we did not want to have a smoky room. As we mentioned in other posts, having open fires is not uncommon here and the sight and smell of smoke can be seen or smelled almost every day, but this was different. We looked out our window and did not see any smoke, we looked out front but could not find any smoke there. Finally we went to the side of the house and there was smoke. The source of the smoke, fire under the ჭაჭა still. I could not imagine the size or bulk of this device. Now I was told this is not owned by our host family but rather only on loan as it cost about $400.00. Here is a few more pictures of this process. With the lid off, you can see the “mash” that will become ჭაჭა. 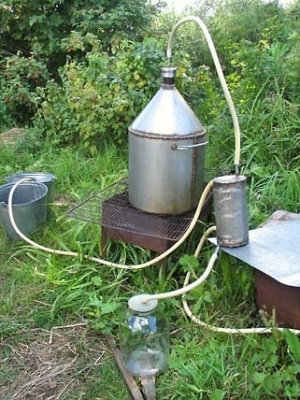 All put together and fired up the still is ready to go. Our host dad, Nodar, tends the fire. 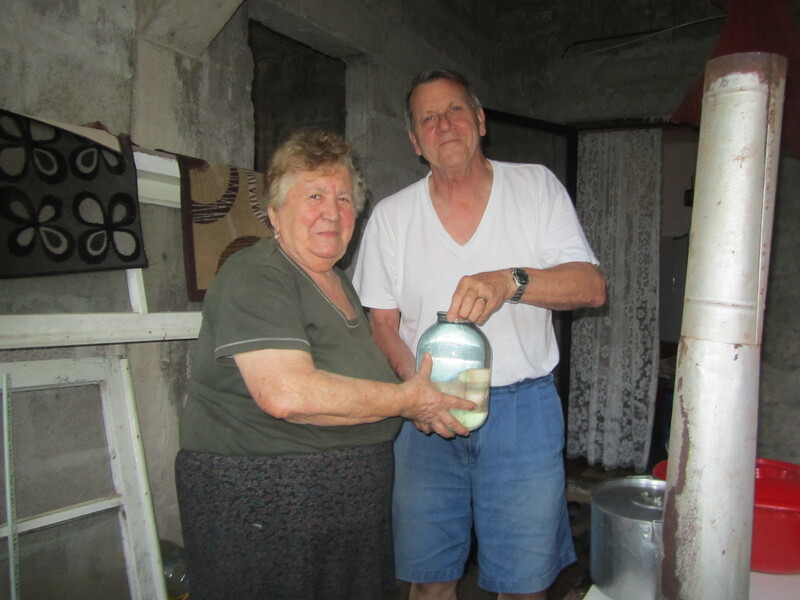 Tom and Bebia holding a 2 liter jug of ჭაჭა. Here we have the 20 liter bottle of ჭაჭა resting with the other canned goods and cheese. It is my understanding there is still another distilling process that has to happen before the finished product is ready to drink. I will keep you posted on the final results during a later post. For now enjoy this short movie. This is a method Georgian’s use to show off the quality of their ChaCha. They light it and check the color. May had a very good begining. 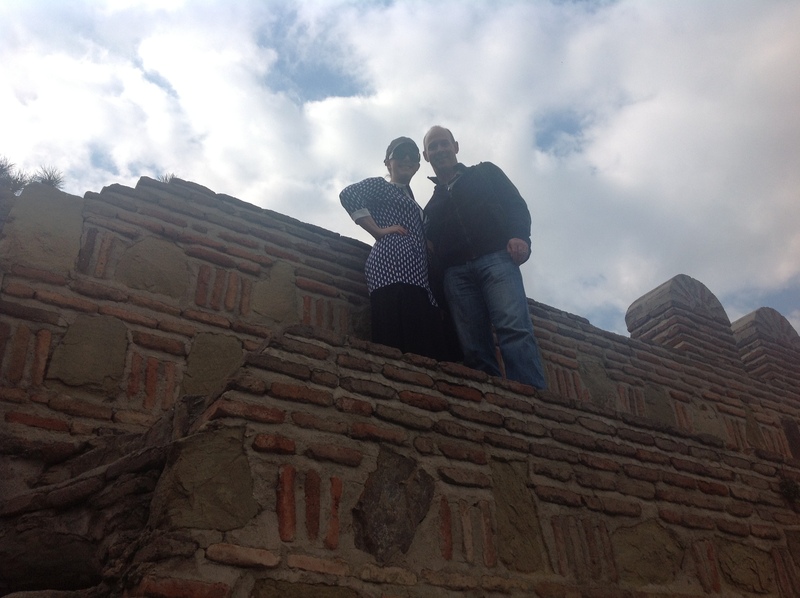 David and Tasha made the long trek from Denver, first to Istanbul, Turkey then to our village of Gonio. They met our host family over a traditional Georgian meal where all had a great time toasting everything under the sun. They arrived on Monday evening, May 6th, the Georgian holiday of St. George. This was a test as they flew from Istanbul to our airport in Batumi. A test because we had heard that sometimes flights here are often canceled for the simplest of reasons but this did not happen. Since they had spent a few days in Turkey they were not as tired as they could have been had they flown straight from the US. Here are some pictures of their visits, come relive it with us. CLICK ON EACH PICTURE TO GET A LARGER VIEW. 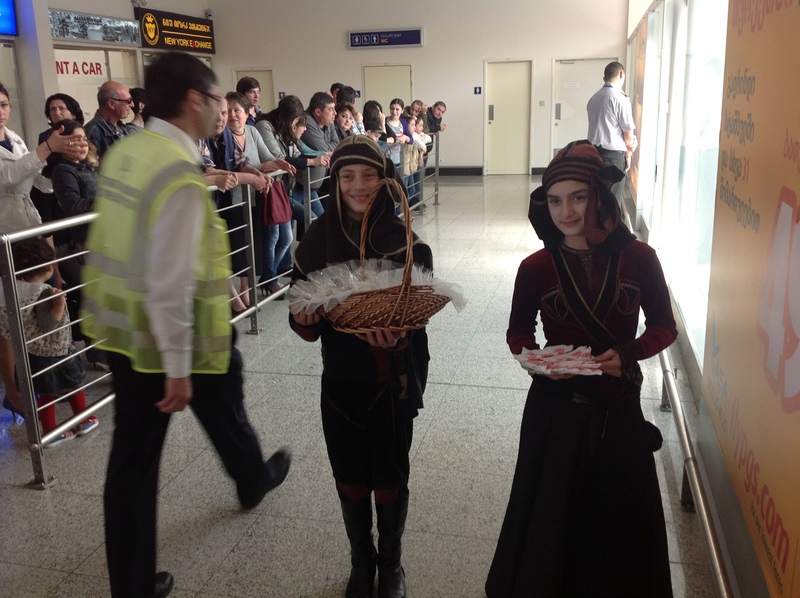 Young kids dressed in regional garb handing out samples of Georgian Baklava to arriving visitors. 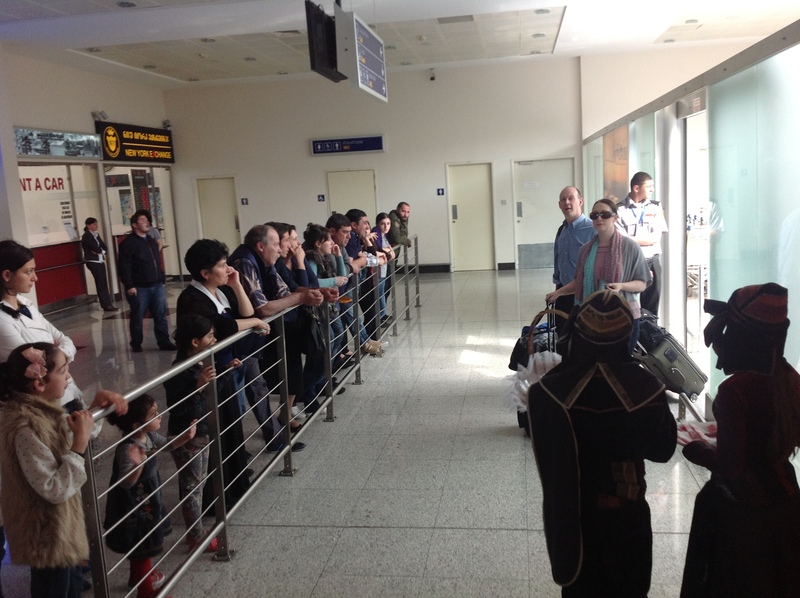 David and Tasha arrive safely at Batumi airport! The airport is very small as you can see from the arrivial area. 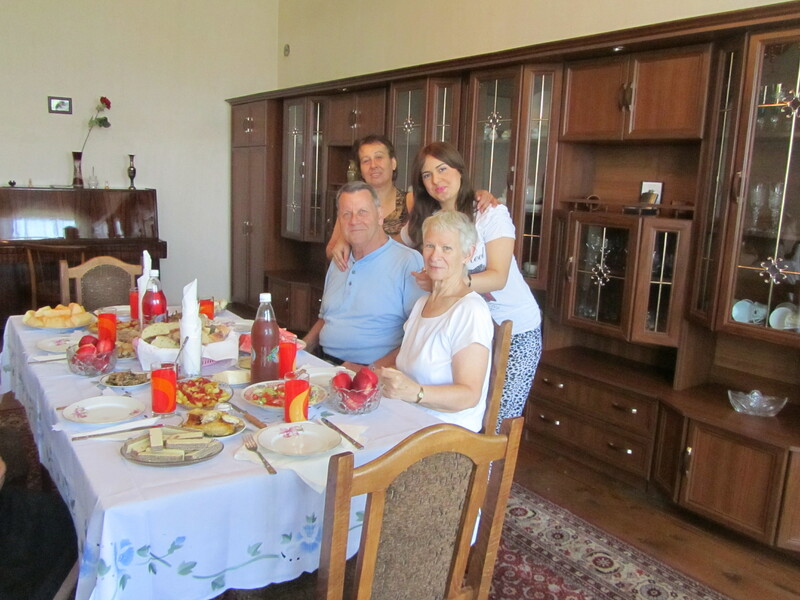 Now we have Suzanne with the full host family., Meri, Bebia, Suzanne, Eliso, Aliko and Nodar. 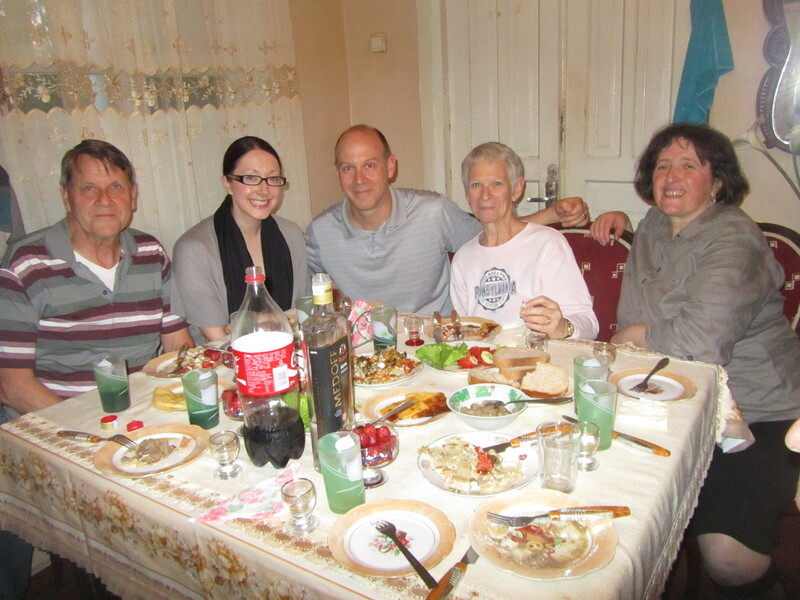 Another picture of Nodar, Tom, Tasha, David, Aliko, Suzanne and Meri. 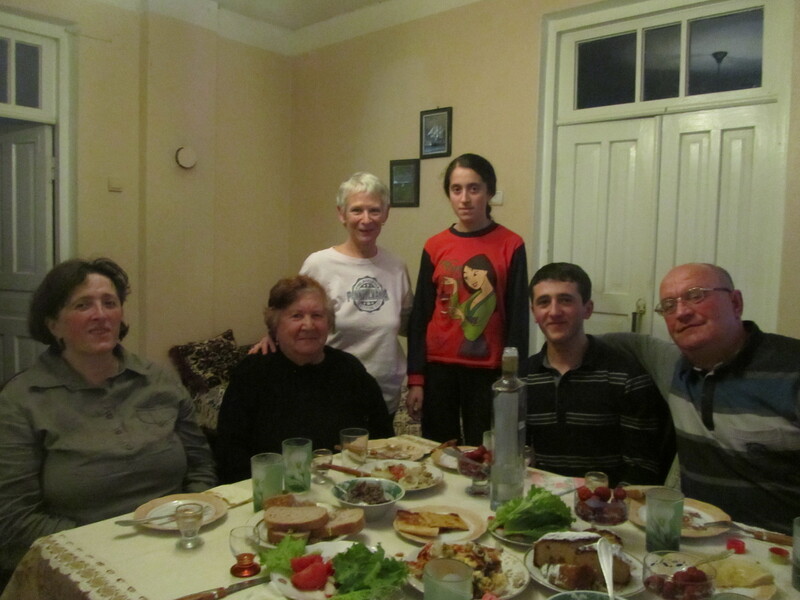 Our host mother, Meri, prepared a wonderful Georgian meal for the family guests. Suzanne, Tasha and David in our room in Gonio. In the background on our door you can see some of Kylan’s wonderful artwork. David taking a picture of one of the many unfinished apartment/condo buildings on the Black Sea beach front. Lunch and a taste of Adjaran Katchapuri. This is a very hot bread dish with an egg, butter and cheese in the middle. It is hot enough to cook the egg and melt the rest. These are always a treat but sharing one is the only way to go! A brief vist to Tom’s office. 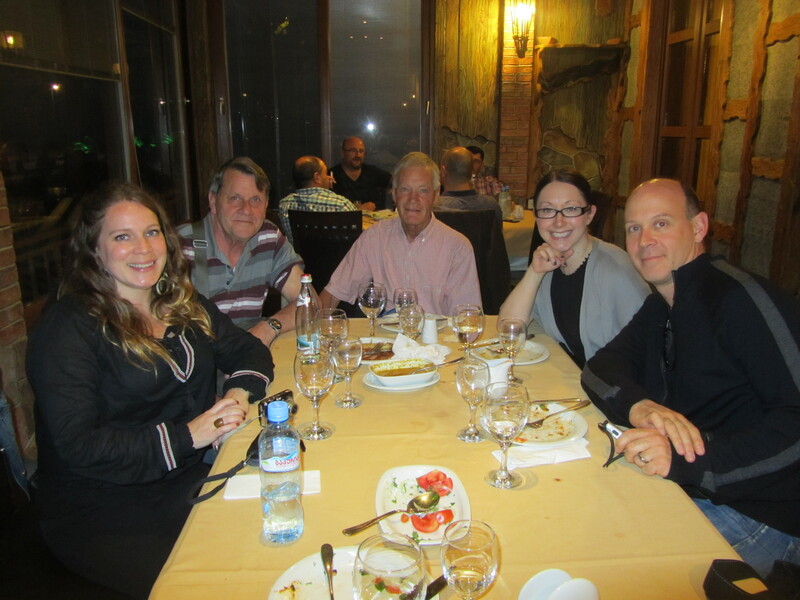 Dinner with PCVs Amy Harris and Richard Letrende. 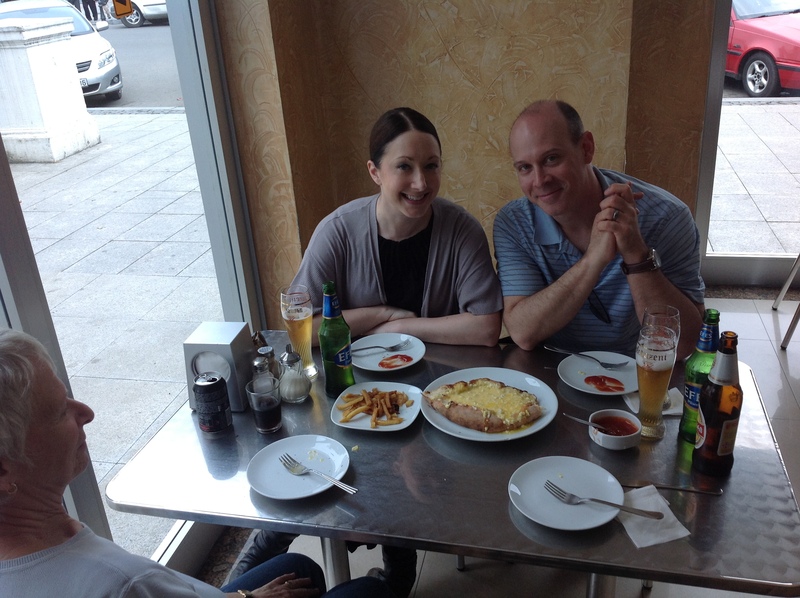 We ate at one of our favorite Adjaran restaurants and the food was delicious and filling. Amy and Richard had stories to tell and Tasha and David enjoyed the evening. 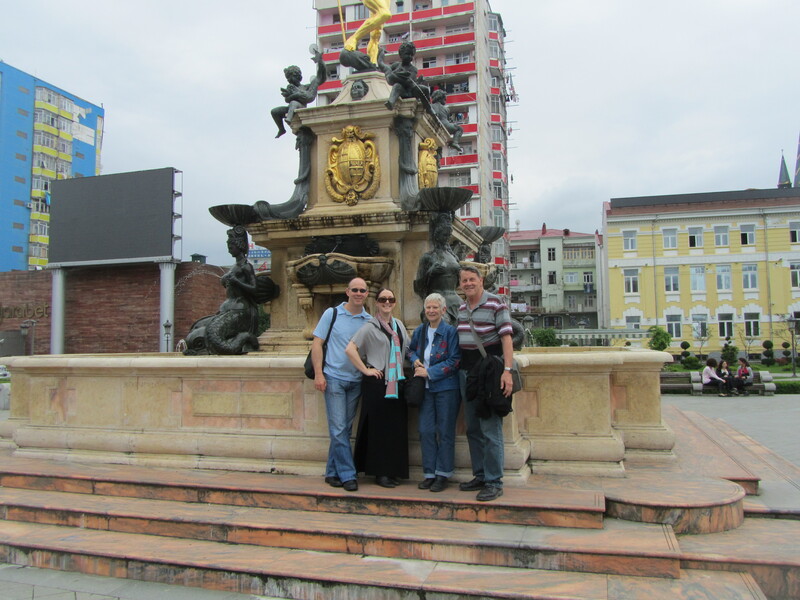 At one of the many fountains in Batumi as we walk the city. David trying to take a picture of the wine bottle label on the train ride to Tbilisi. On this trip we were some of the first people to ride the newest train, a recent arrival from China. In front of the Church of the Holy Cross. 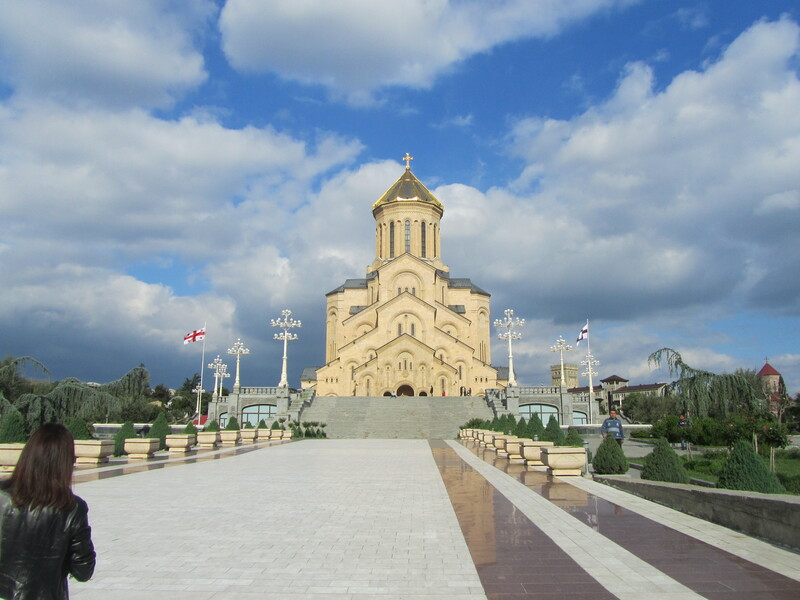 This is one of the most outsstanding monuments of Georgian architecture and a center of pilgrimage for Christian nations of the Caucasus. This site is awarded the UNESCO site, a World Heritage List confirming its universal cultural value. 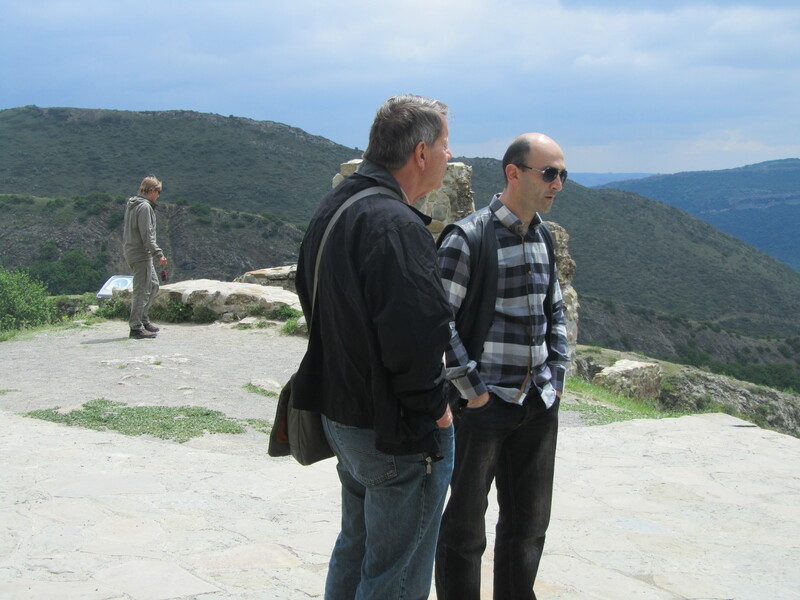 Hanging out with our driver/guide who took us on a day tour of some important sites in the capital city, Tbilisi. 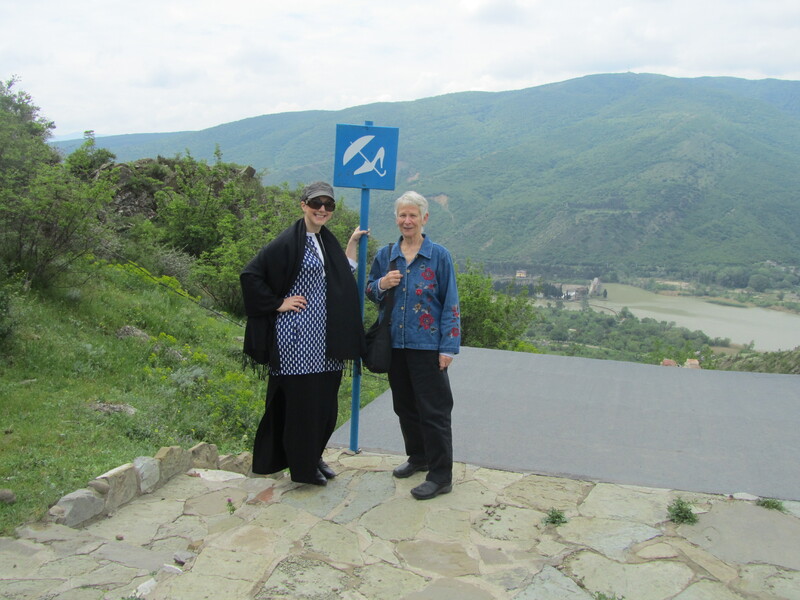 This is our starting point, Mtskheta, where the first church was built in the beginning of the 4th century. There is a funny story about this sign which indicates there is a woman’s toliet down the stairs. Tasha and Suzanne had a good laugh but you’ll have to wait for the long explanation! One of the many tourist shops in Meskheta. Lovely handmade scarves, slippers, bags, etc. are offered at the many tourist shops in this area. Christmas shopping anyone??? The tour group in Meskheta. This is the Jarvi Georgian Orthodox Monastery in this same area in Mtskheta. It is still and active monastery for a small number of Orthodox monks. One of the steel gates to the monastery in Meskheta. 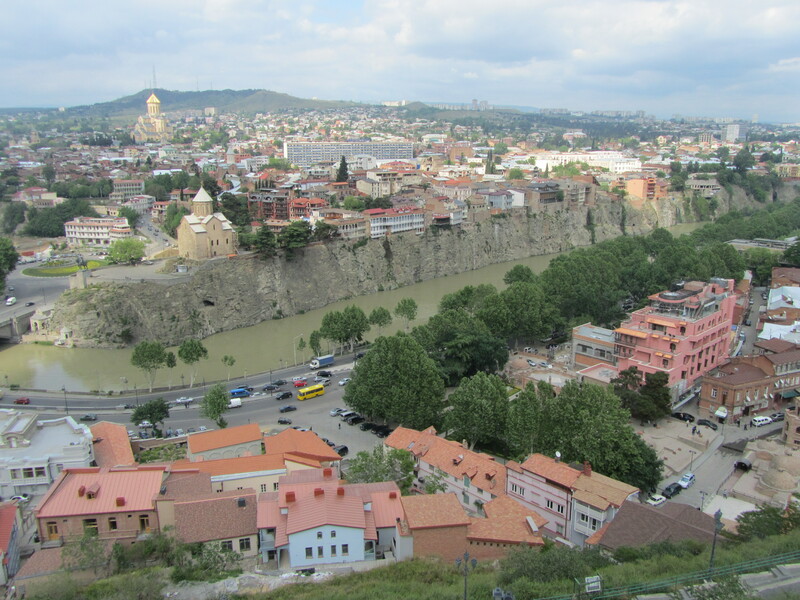 A view of part of Tbilisi from the Tbilisi fortress overlooking the Kura River. The Fortress was originally built in the 4th century and expanded in the 10th century by King David the Builder. 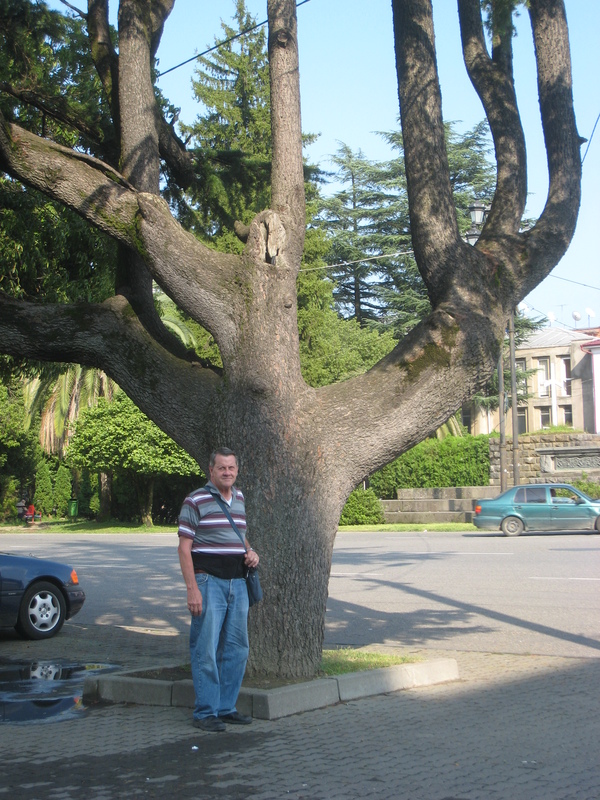 It lies on a steep hill between the sulphur baths and the botanical gardens of Tbilisi. 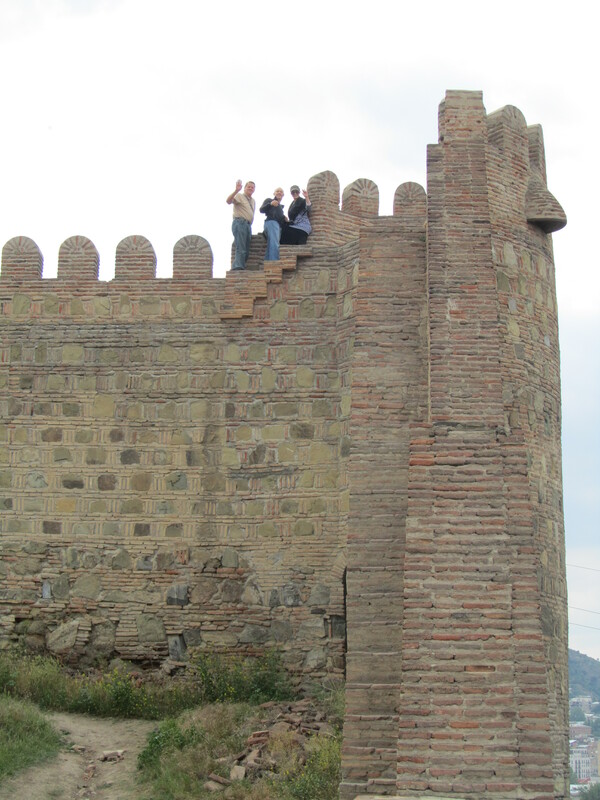 Tom, David and Tasha high up the fortress wall. 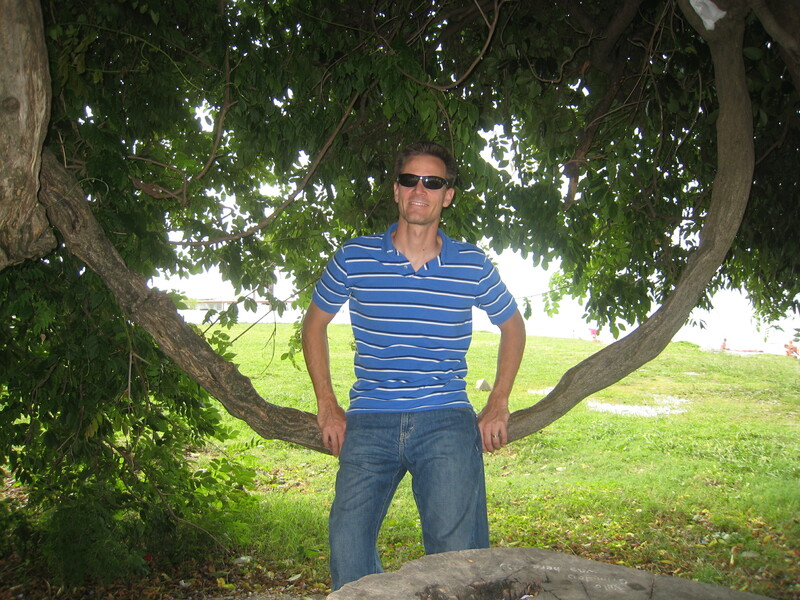 Suzanne was the photographer for this photo as she didn’t feel compelled to do the climb. 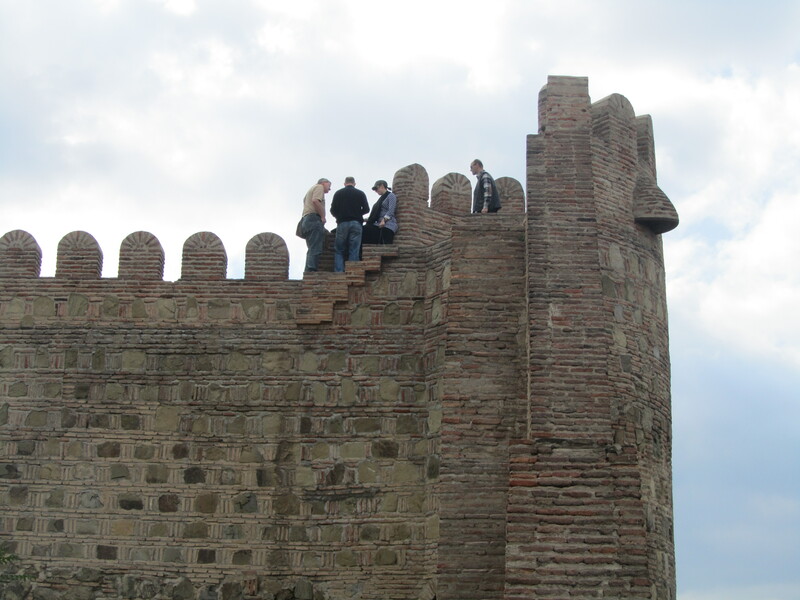 High upon the fortress wall in Tbilisi. In 1827, parts of the fortress were damaged by an earthquake. One of the many statues of King George. Another view of the high perch. 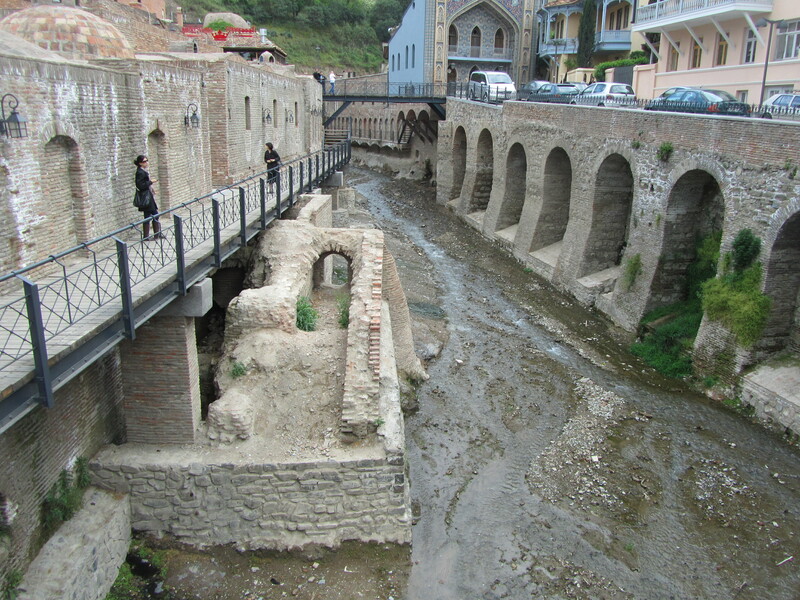 Looking down the row of Turkish sulfur baths found in Tbilisi below the Fortress. They are still in use today. 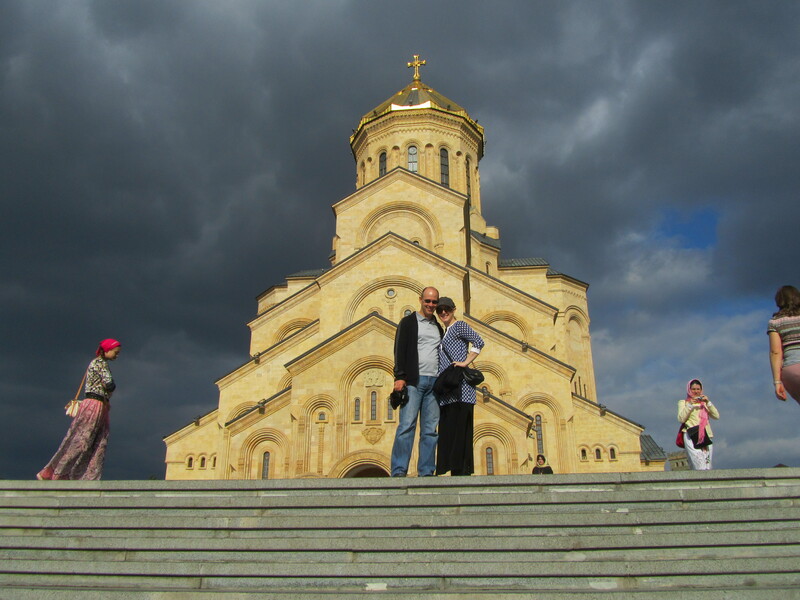 Approaching Holy Trinity Cathedral of Tbilisi. This is to the Georgian Orthodox as St. Peter’s in Rome is to the Catholics Church. Can you believe it has been a year since we left Colorado for the Peace Corps? Well it’s true. We left our house in Aurora, CO on April 26th 2012 and headed for Philadelphia, PA for visits with family and friends before heading to staging with the other new PC Volunteers. We would soon become known as G12s the newest volunteers for the country of Georgia. Now it is the beginning for a whole new crew who arrived April 23rd and are full of enthusiasm and excitement and questions! We’ve decided this time to take a look back at our year with pictures we’ve taken, some of which reflect the theme “what you would never see in Aurora”! We hope you enjoy looking at them and reading a bit about our journey in this country. Sunset over the Black Sea. This is the place to be in the evening when the weather is warm and balmy. It brings peacefulness and splendor to the end of a busy day. It reminds us of how small we are in this world of many cultures but also presents possibilities of moving across the water to find something, someone new to greet. 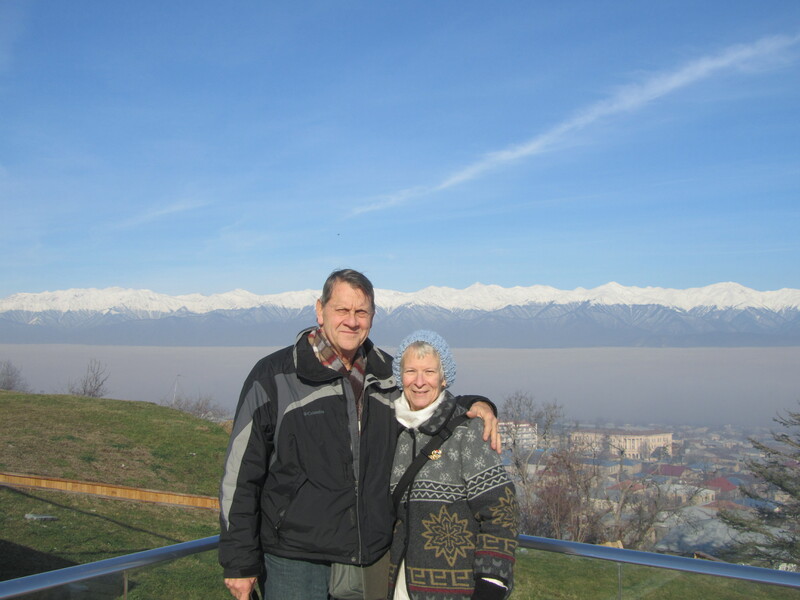 From the Black Sea to the majestic Caucasus Mountains…..this view in winter is taken in Telavi where we spent our first 3 months in training. The grey band in the middle is really a heavy fog bank covering the Telavi valley. The many small villages normally seen from this location are blocked by the fog while the white caps capture your eyes. 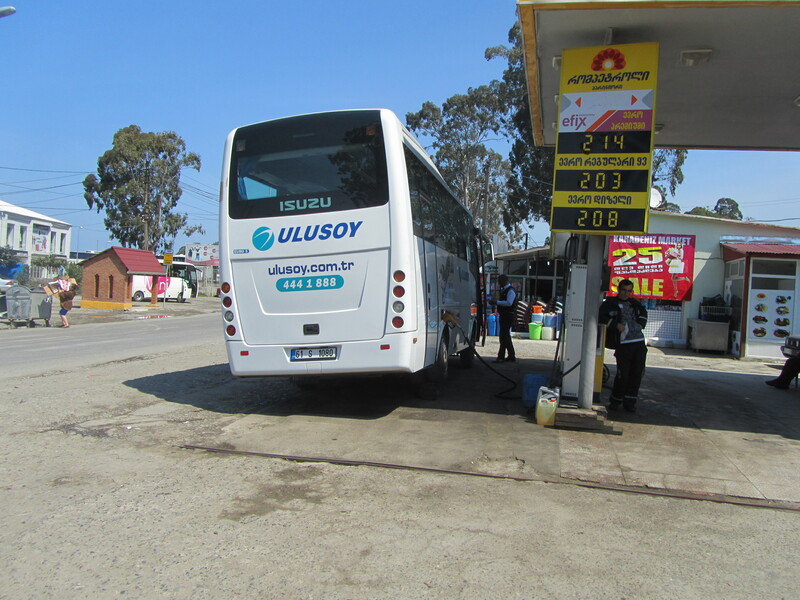 When you want to really fill up, tilt the bus. It is an oddity here in Georgia…… for some reason many vehicles are raised on the gas tank side so that the tank can be filled to the brim. We have yet to figure out the need for this other than it might be many miles before the same type of service station is available. What we don’t have pictures for the many times we have seen customers fill all sorts of plastic bottles and jugs with gasoline. The sign spells out HAMBURGER. Fast food! 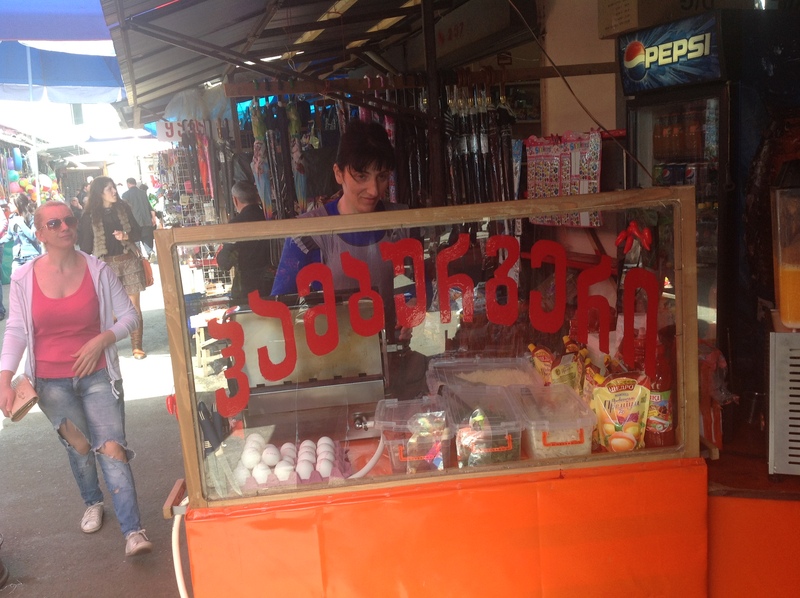 This is one of many Hamburger stands in the local bazaar. Now the hamburger is really half a loaf of bread pressed between the hot plates of something similar to a George Forman grill. It is filled with sausage slices, cheese, onions, a cooked egg and, if you want some spices. Mayo and ketchup are also an option. The finished product is a sandwich that is about a 1/2 inch thick. 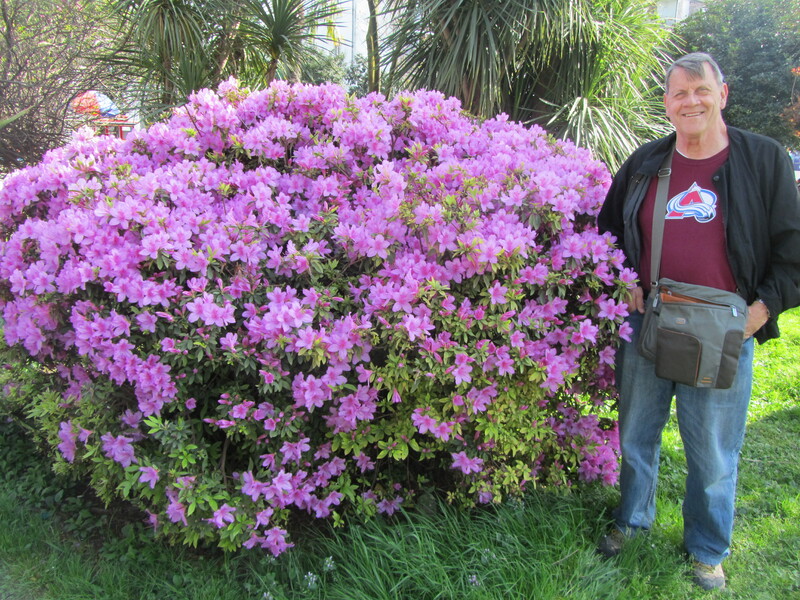 Yes, this is an amazing Azalea bush in one of the larger parks of Batumi. We took this in early April. The weather was still changing from cold to warm but it didn’t seem to bother the many flowering plants. You find almost every kind of plant life here from tropical palms to holly bushes and trees. Many of the trees don’t ever lose their leaves even in the coldest winters. 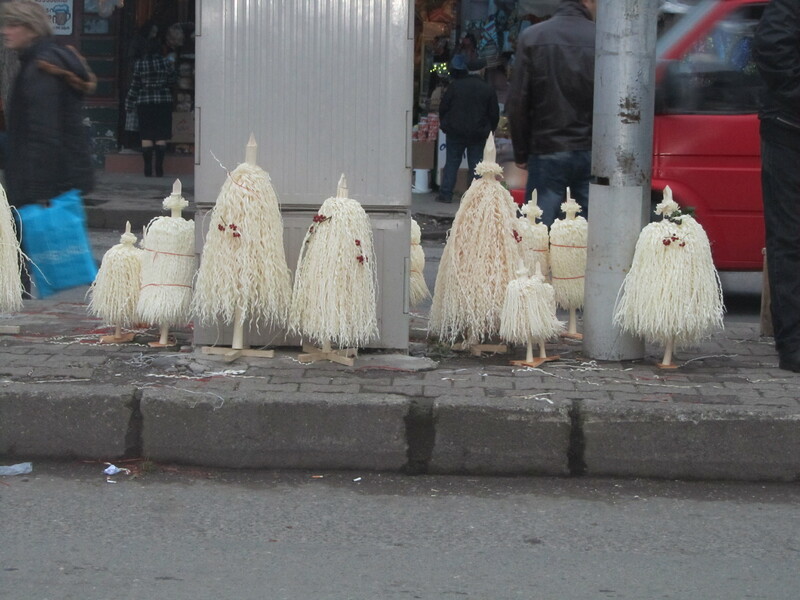 Chichilaki is the name of these cute little Georgian Christmas trees. They range in size from 6 inches up to 3 feet. They are made from walnut branches that are shaved to form the shape. Just a few decorations are added. Our familiar Christmas tree is also available both live and fake but most families don’t buy them. After Christmas these walnut trees are burned in the home fire. Winter comes and so does the “petchi” stove. 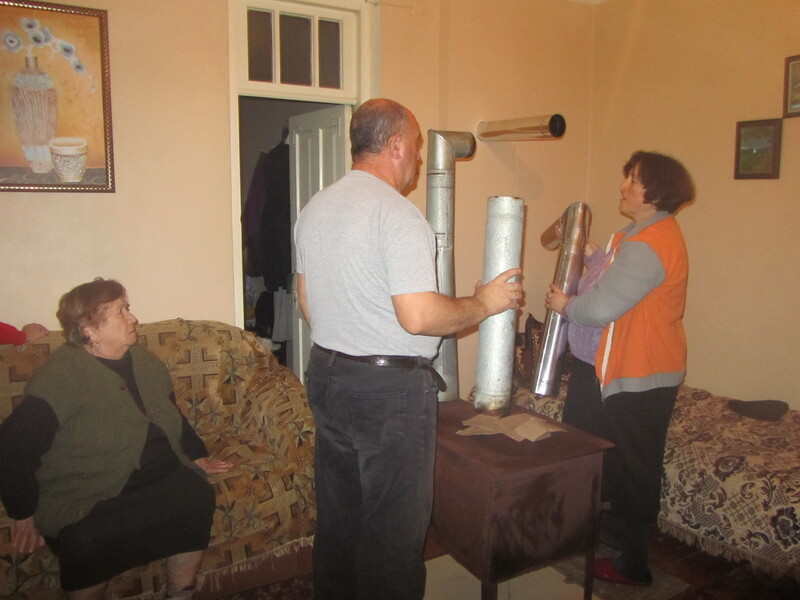 Our host family (Dad, Mom, Grandma) are putting up the petchi stove for the fast approaching winter weather. The stove is put in the main living room and stays in the house until today (May 4th). New pipes are installed each year. 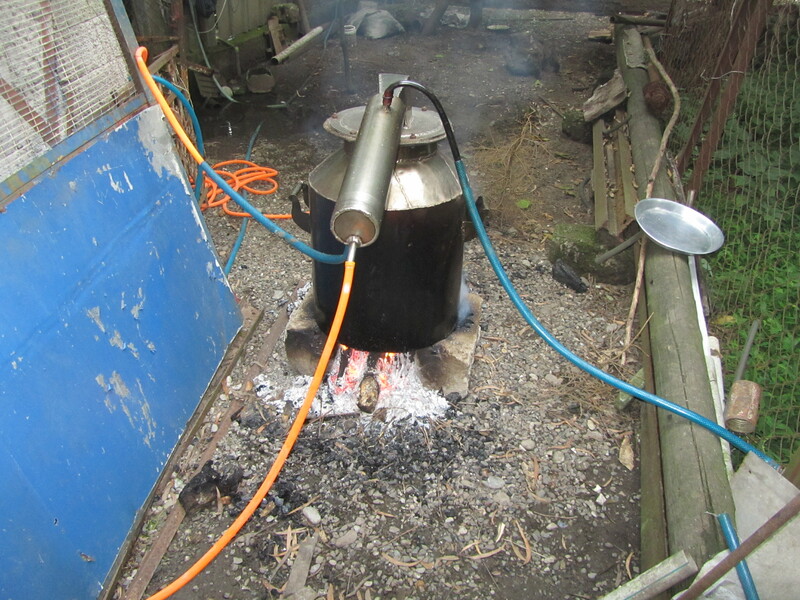 It is used to heat part of the house, bake the bread and cook some food. There is always hot water for tea (chi)! The room gets a bit crowded when we are all trying to stay warm….7 bodies! Mr. Ambassador and Nicole serve Thanksgiving dinner. The U.S. 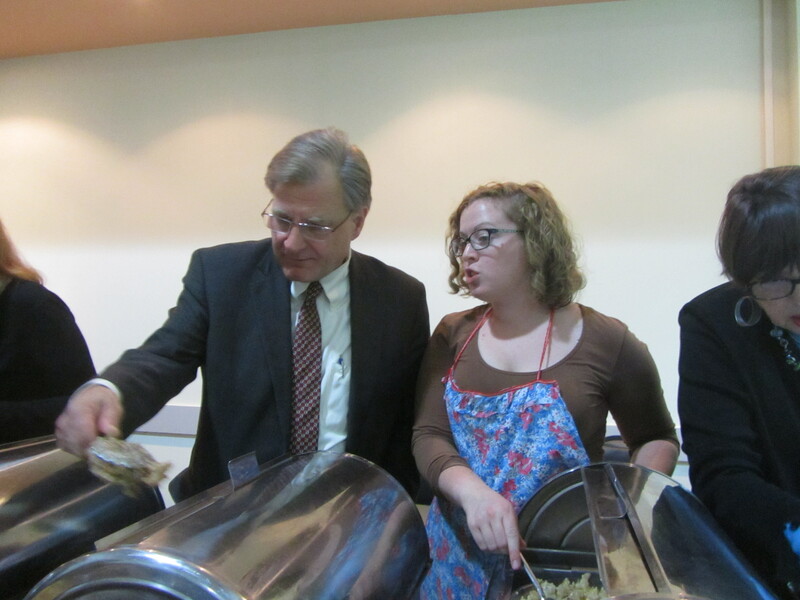 Ambassador, along with fellow PCV Nicole, are graciously serving our very own Thanksgiving dinner. We were well over 100 people gathered and the volunteers did all the cooking except for the actual turkeys which the Peace Corps staff supplied. We had all the fixin’s’ including pumpkin pie with cream whip (if you were lucky). This was truly a fun evening of fellowship and conversation along with a good supply of wine! 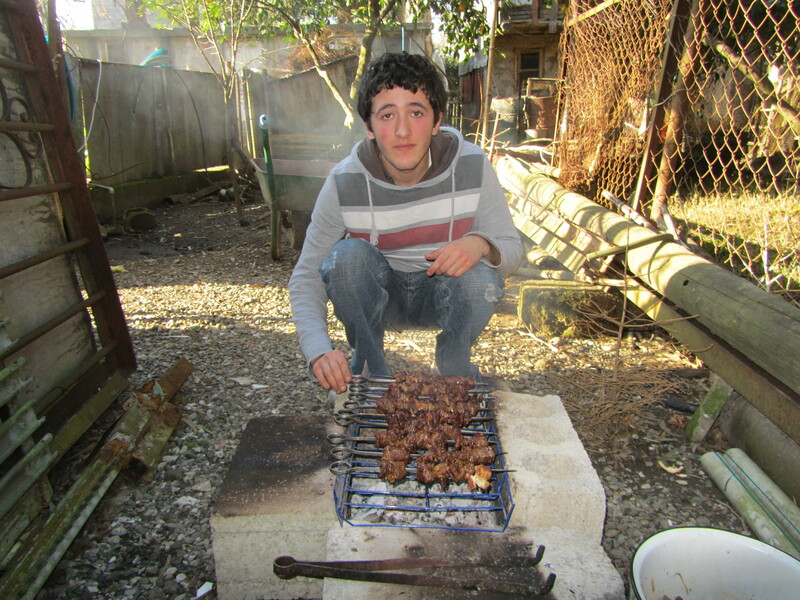 This is our host family member, Aleko, at the barbecue pit. In Georgia, the word “barbecue”means only the food you eat. 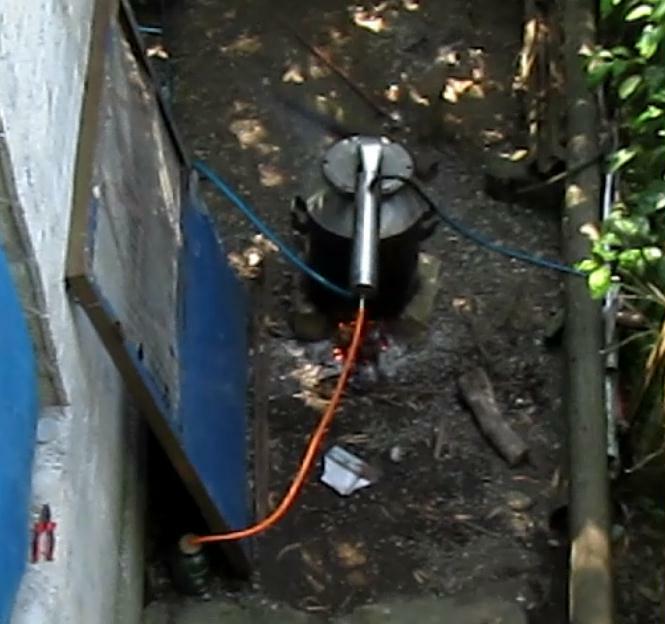 As you can see they set up the cooking elements from cinder blocks and some type of grill pan. They don’t understand what we call a barbecue grill or that it can be a meal without meat! So our experience is that we have chicken on a skewer cooked over a wood fire. No charcoal briquettes here! 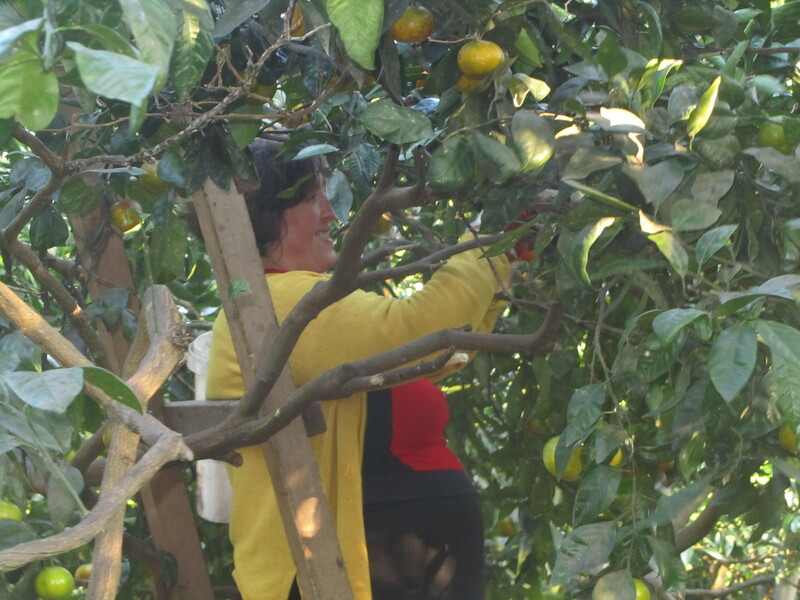 Meri picks oranges from the family grove. Time to pick the lemons, the oranges and the mandarins! And our host Mom, Meri, is just the lady to do it. She is a physics teacher, a gardener , a chef, a farmer who tills the field, plants and harvests, and so many jobs that I can get tired just watching her. 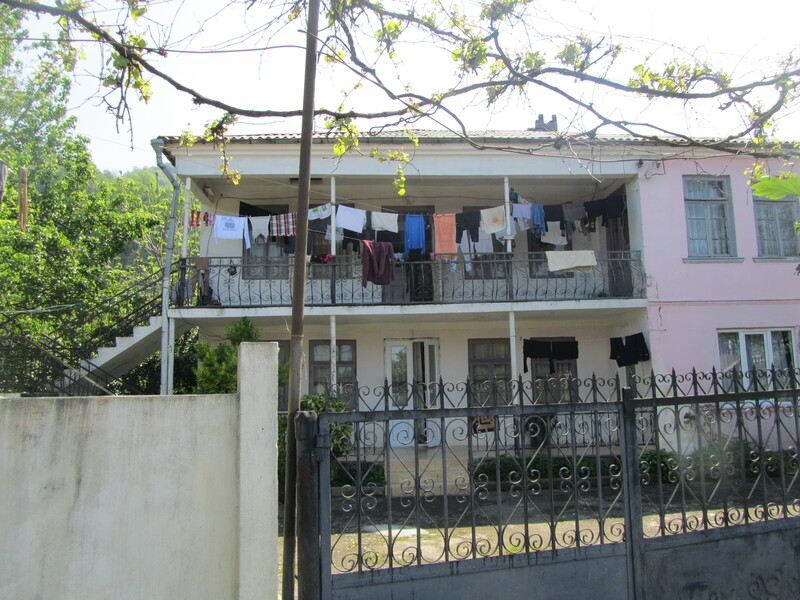 When traveling through a village it is usual to see folks’ laundry hanging in the front of their house. We haven’t seen any clothes driers at all in this country although there probably are some in the big cities. They don’t hang in the back of the house because that area is usually full of large trees. In the apartment houses, there are many lines stretched out over the parking lots attached to free-standing poles. No need to be bashful in this country because everyone has seen your underwear! Cows have the right of way. This poor cow is all alone. This is very unusual as these beasts mostly travel in herds. 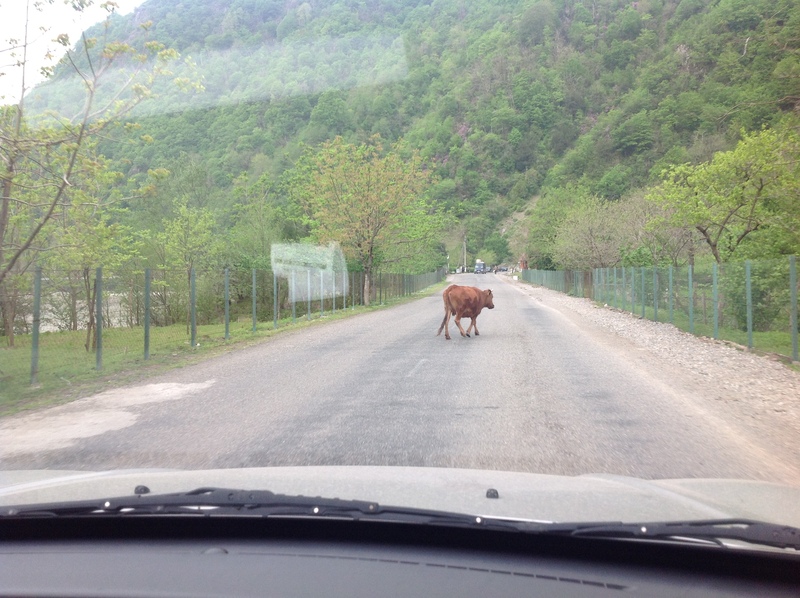 It is a common sight to see them on the road stopping cars and buses….much to the dismay of many drivers. They are protected, however, by law and hitting one will cost you plenty. They are considered someone’s livelihood and are given the respect they deserve. Just always watch where you are stepping! Now we know where Elvis lives. Who knew???? 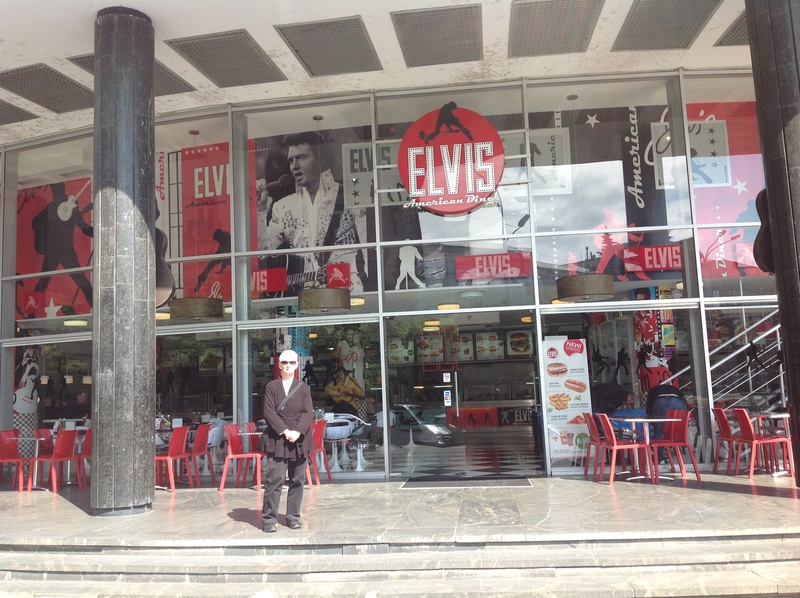 We found this bit of Americana quite by accident when we were traveling around Tbilisi. They advertise all sorts of goodies familiar to us (hot dogs, fries, shakes, pizza, etc.) but it was still morning so we didn’t partake. BUT we will go back and check it out when we get really homesick for a good hotdog and shake! Easter Vigil, 2013 — Church of the Holy Spirit, Batumi, Georgia. Christ is Risen! 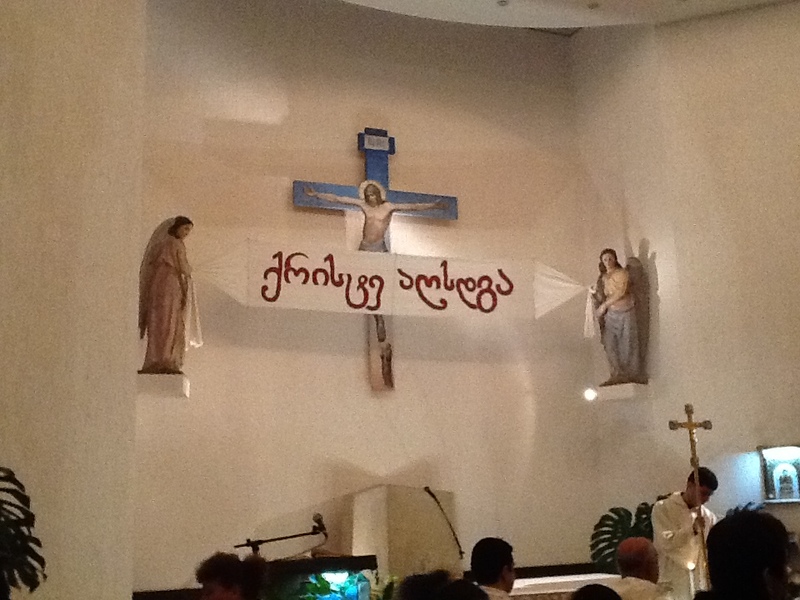 (That is the translation of the banner held by the angels.) And how could we not go to the Easter Vigil? Luckily, Suzanne has most of it memorized as it was all in Georgian language. 2 Adults and 2 children were baptised amid a crushing crowd of relatives, friends and several television cameras. We made the TV the next day! Some of you may have seen a picture of the Easter fire which put our churches to shame. It was a lovely, memorable, grace-filled evening. We end this post with a series of pictures of other events we have yet to see in Aurora, Colorado. If anyone has seen these things in recent memory please don’t let us know. We want to keep our innocence. Construction of the Gonio Boulevard. The Black Sea is to the left. 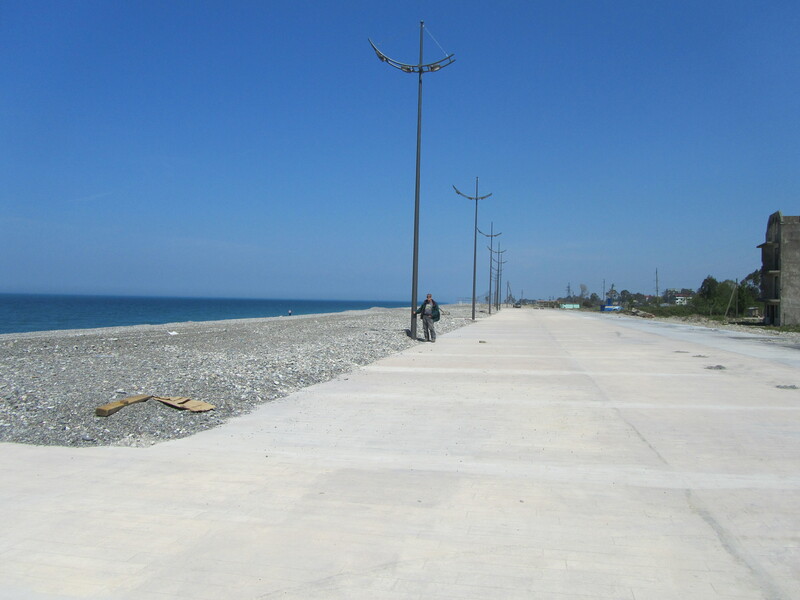 Here I am standing on the “New Boulevard” being built along our beach in Gonio. 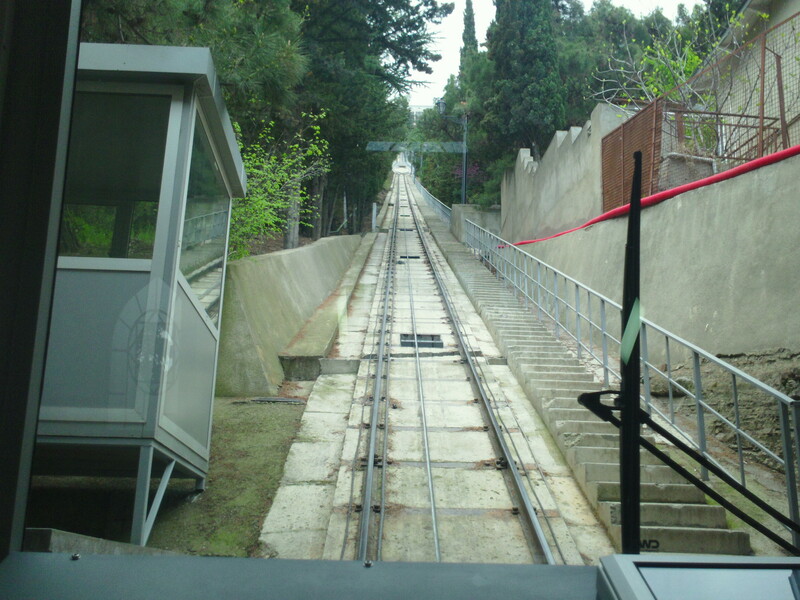 In Tbilisi there is this cable car which takes you up the hill to a park and the Georgian Church of Saint David. Quite a sight and ride. Most water public water fountains at home have on-off valves. 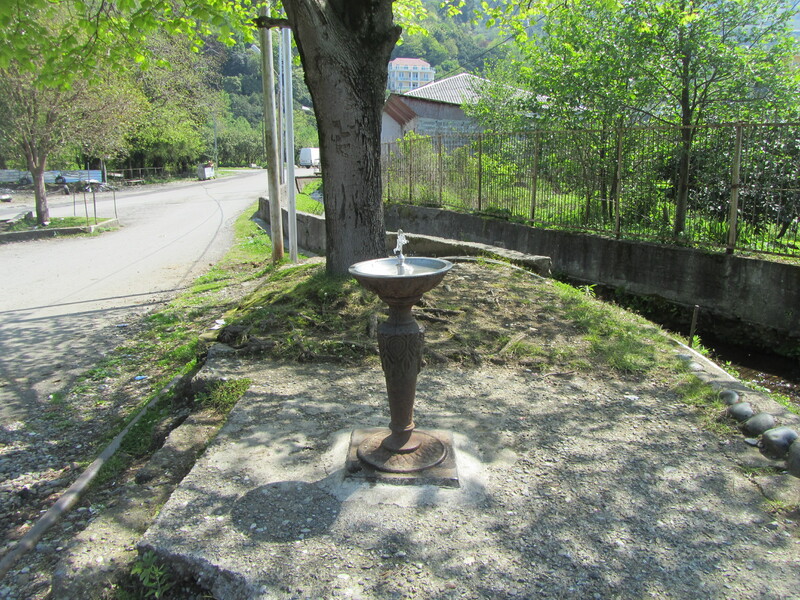 In Georgia you will find many fountains just bubbling away waiting for a thirsty soul. 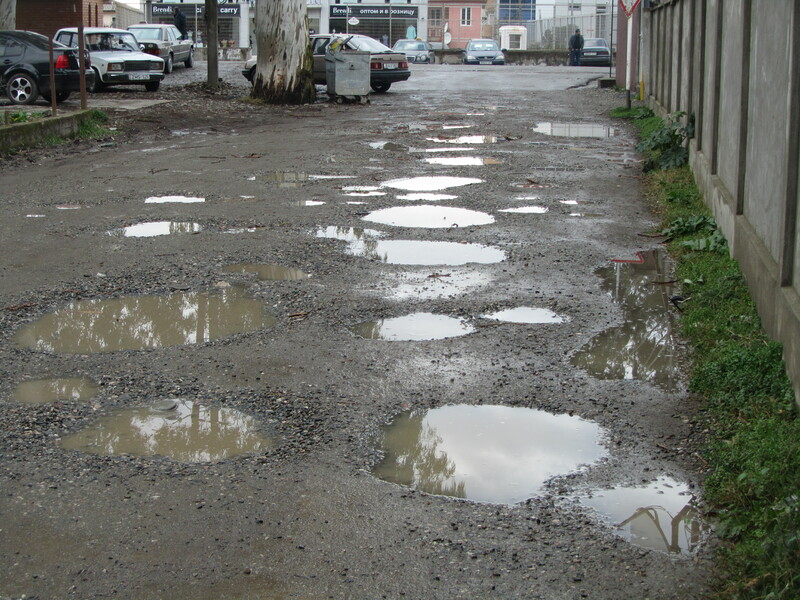 A street during the rainy season. Paved streets are only in the big cities. Here in our village we have to navigate around the many puddles after the rain. Suzanne helped make the Churchkhela this year. These are hazelnuts dipped in a thick grape juice mixture. Shirt Mop on a stick. The caption is correct. You do see regular mops in some of the bigger stores but most often you will see women using this contraption – a T shaped device with a damp old shirt wrapped around it. Interesting and it works. 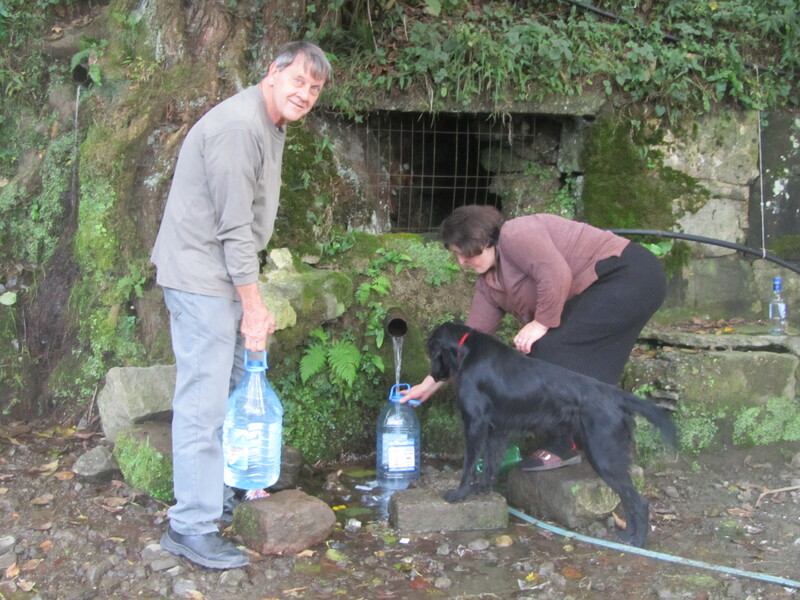 Fresh water from the mountain spring. 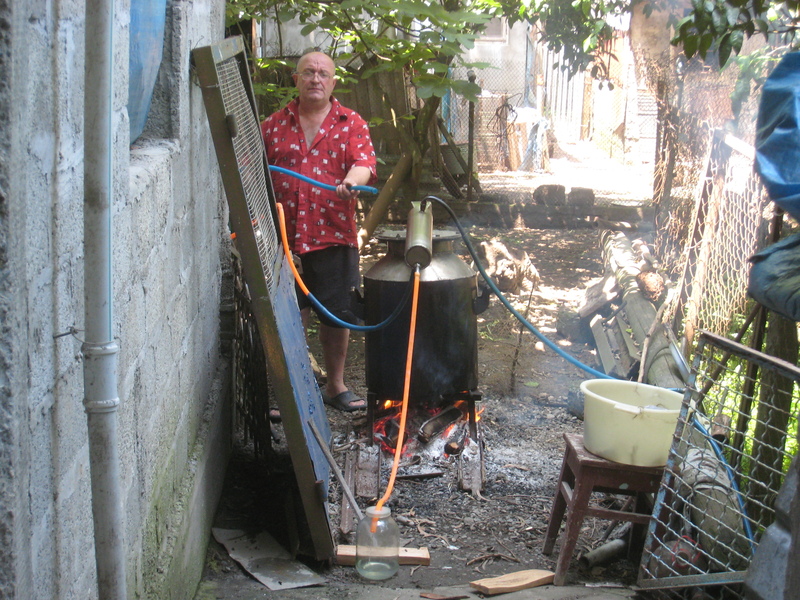 For good clean and cool water we take trips to the local spring to fill up our plastic containers. We still run ours through our water filters before drinking. Men straightening out metal rebar. Nothing seem to go to waste here except trash and plastic bags. 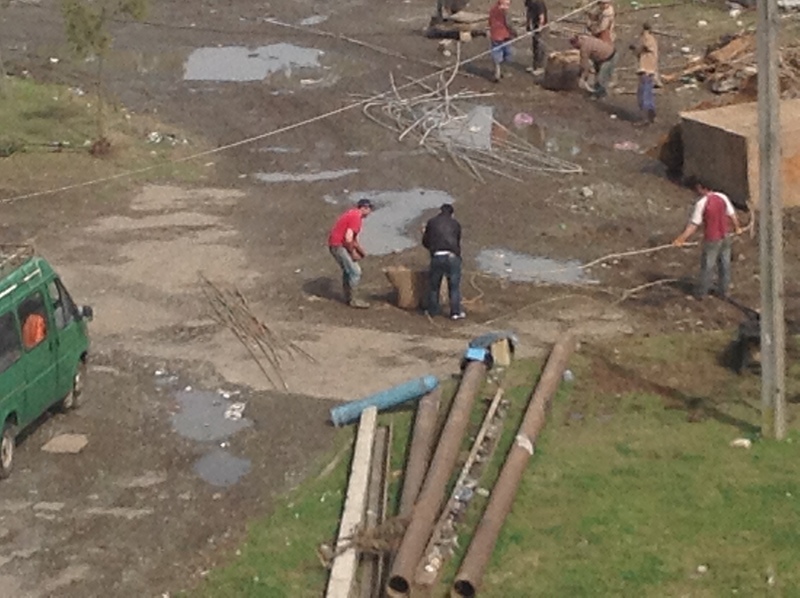 In this picture men are using sledge hammers to straighten out bent rebar salvaged from a building just demolished. We are used to the Americans with Disabilities Act and all the changes made for wheel chairs. Here in Georgia they are making progress. 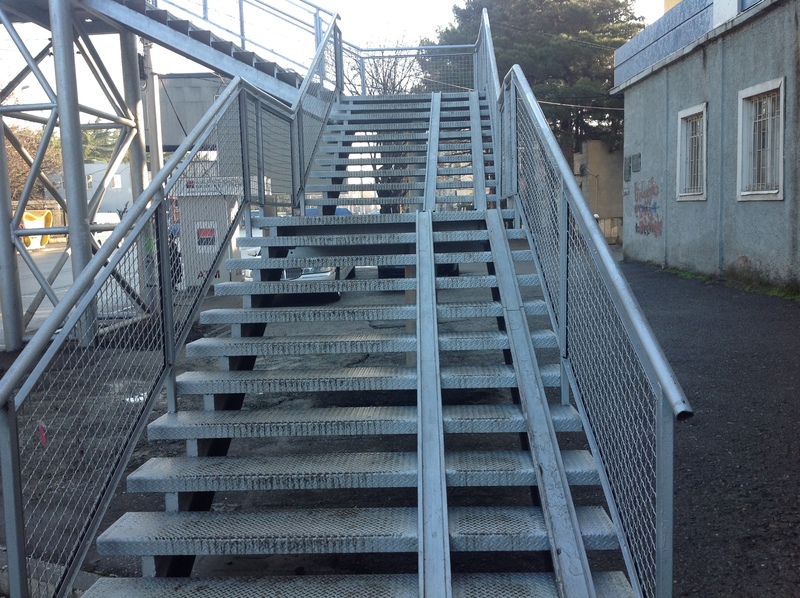 Here is an example of wheel chair accessibility on a set of stairs going up to a road cross over bridge. Just don’t lose your grip on the way down! This final entry is a short video of something you should not see in Aurora or all of Colorado for that matteer. But Tom forgot to say….. I was unavailable for comment last night so Tom posted without me. So, let me fill in a few blank spots for you. The writing competition was for “creating” writing. An important distinction as the Georgian students don’t seem to understand this concept. It is a learning experience as well as a competition. The starters for their essays were according to grade level. For instance: for grade 9 one of the starters was “If clouds were edible what would they taste like”. Another class had “What should be free for everyone in the world”? I liked one of the 12th grade prompts: “If death were a person, what would he/she be like”. I think those of us who proctored went home with a lot of new ideas floating around in our brains. It was very stimulating. Two important items for us are: 1. a visit from David and Tasha in May, and 2. 4 March birthdays to celebrate. D & T will come east to visit and combine that with some time in Turkey. Do I really need to tell you how excited we are to have them come? (Of course, NOT) The 4 birthdays were our host mother, Meri, who is a leap year baby but she celebrates on March 1st (she is 12 at present), then yours truly (whose age is irrelevant), on the 11th Aleko turned 18 and on the 17th Eliso was 16. Can you even imagine all the cake that was baked? The teens party was a joint affair on St. Patrick’s Day with lots of family and friends coming to eat an incredible amount of home-prepared food. 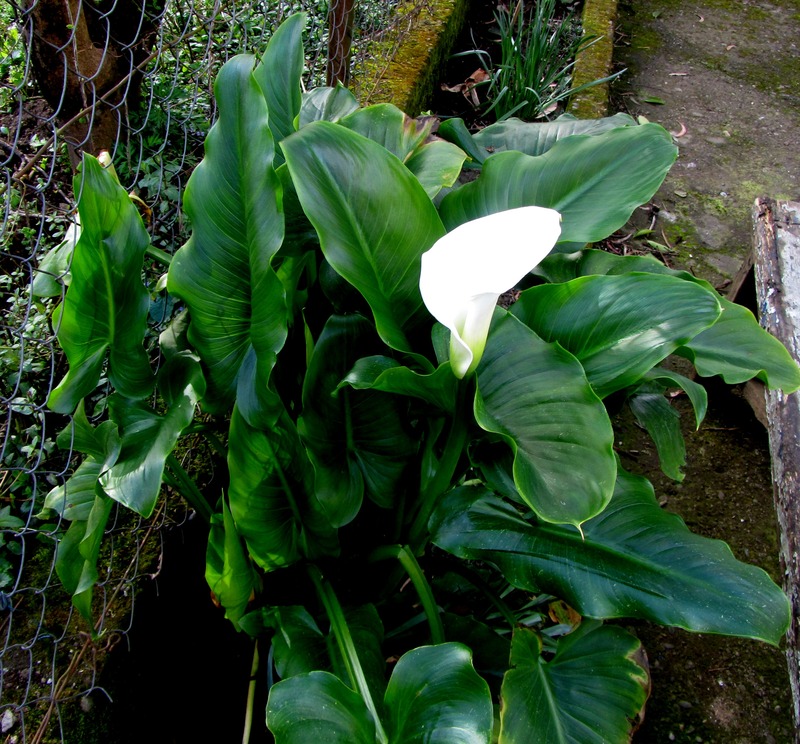 Since Tom’s theme was the arrival of Spring, I was surprised that he didn’t mention the calla lily plants that are blooming in our front yard. Despite a very cold, humid winter we are in a tropical zone and many plants and trees seem to survive the harsh weather just fine. Daffodils are plentiful in the yards around us and forsythia is blooming. Vegetable gardens are already being prepared by some as we see them turning over the ground in preparation for planting. Now here is an FYI…teachers take note! There is no such thing as a substitute teacher in our village and I suspect in most of the country. When a teacher must be out for any reason, the class schedule gets changed for that day. Can you imagine what havoc that creates? Teachers are moved to other classes and the schedule gets changed as well as the rooms. I spent more than a few days recently trying to find out where I was supposed to be! It usually means a skipped class for some students as well as an earlier dismissal. When I explain to my counterparts about our “substitute” teachers in the U.S. they are envious. Finally, some of you may know that besides our primary duties as teacher or business person the Peace Corps encourages us to find way to improve our primary communities. Here in Gonio, we are the 3rd PC volunteers at the school. So my predecessors were able, among other things, to get funding for an English Cabinet. The word ‘cabinet’ in Georgian merely means a room or office, and so an English cabinet is a designated English room at the school. We have our own computer and some other useful resources such as a small library of English books. I hope to be able to expand the availability of some good books for the 10 to 16 age group as these are the ones most needed. However, my major aim for the school is to achieve a Science cabinet. Biology, Chemistry and Physics are taught with very old equipment and minimal supplies. So, once we have a full explanation of what is needed I will be attempting to write a SPA grant to try to fund this adventure. The science teachers are very excited and, of course, this means work for them as they must provide me with lots of information of what they need, the costs of everything, etc. So…that will keep me busy all this spring and probably into the summer. My hope is that we can have completion for the start of next September! We LOVE hearing from YOU. Keep those cards and letters coming folks (a prize for the person who can remember who said that at the end of every radio/TV show)! Three o’clock in the morning, is there a doctor in the house? Sunday morning January 27th 2013, 3am. Suzanne was having difficulty with some pretty serious pain which had started much earlier in the evening. It was serious enough that we called our PCMO, that is the Peace Corps Medical Officer, and also woke up our host dad who is a doctor. They conferred and thought it might just be spasms so an antispasmodic medication was given to her. The hours passed. Things seemed to quieted down, but by 5:30 AM the pain was back with a vengeance. Another call to the PCMO and it was decided a trip to the hospital was necessary but which one? Near our site is a well equipped medical center. But in Tbilisi, near the Peace Corps office, is another hospital which is prefered by the PC and which is excellent. Arguing for the closest site didn’t win. The PC doctor felt they didn’t have the ability to do some procedures and didn’t want us to lose time there. As this decision is being made Tom pulls out a suitcase and starts putting clothes in….meanwhile, Suzanne is trying to give him suggestions on what to take while trying to control the pain. Now here is the good part…. the Peace Corps arranged for an ambulance to come to the house. Once there they checked Suzanne and cleared her for the trip to Tbilisi. If they had detected anything to prevent this, the trip would have been to the medical center near our site. 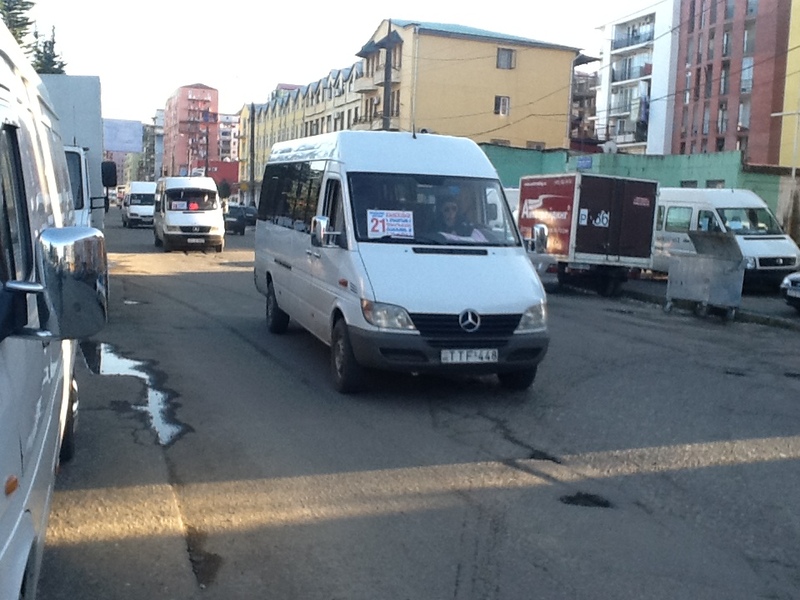 So it was off to Tbilisi on a 5 hour trip with an occasional siren sounding to move us quickly through traffic. As we are settling into the ambulance, we realize the whole family is now up and very concerned for me. Our host mother sees only one blanket in the ambulance and runs to the house for another one for Suzanne. In the pitch dark of early morning we are all settling in and saying goodbye to our host family. I’m not sure how I managed to stay silent during that ride. I had been given no meds of any kind. Tom says I fell asleep but I don’t remember doing so. 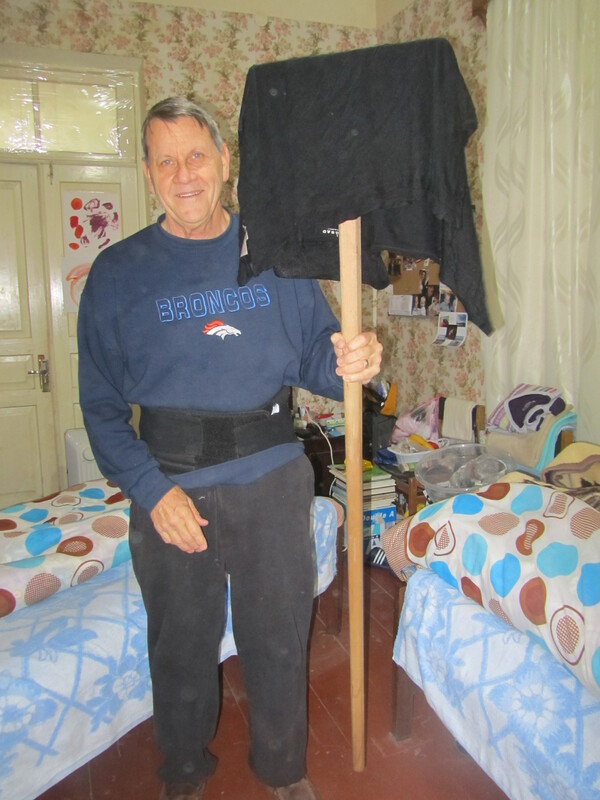 We arrived at the hospital ‘Medi-Club Georgia’ and very quickly I was evaluated, given a CT scan and learned I had acute appendicitis. Since I was stable the decision was to operate the next morning. The operation was a laproscopy and went very well. The rest is pretty boring…a 4 day hospital stay in a very, very nice room with minimal meds and interruptions. The staff was excellent and the food okay (a soft diet). The only real issue I had was that I didn’t sleep very well the whole time I was there. There were very strict visiting rules but Tom managed to circumvent them, clever sleuth that he is, and be with me most of the time. “No eye contact” was his method! Finally, I was released but needing to stay in Tbilisi til the stitches came out…about 5 days. Tom had been staying at a hostel that the PCVs used but said it wasn’t appropriate for recovering so he booked us at the Holiday Inn. It was wonderful as I slept well and we went out for short walks each day extending them just a bit. Today the stitches came out and we have tickets on the early train tomorrow for Batumi/Gonio. One final note…I have achieved great status among the PCVs as surviving surgery in a foreign country. Thru no effort of my own. All the plaudits go to the Peace Corps doctor (Dr. Tamara) who was with me every step of the way as my advocate, my advisor, my friend. She was tireless especially since our other doctor was on vacation and there were 3 volunteers in the hospital! I am so very grateful for the regulations that are in place for our benefit and for the first rate facilities chosen for our care. And I am totally confident that every PCV would be offered the same assistance in whatever health situation they may find themselves around the world. Medi Club or Club Med? Finally, first breakfast after 3 days. Walking the halls after surgery. Needed the exercse. This is my humble bed and room. Last morning before heading back to Gonio, room service, this is so not Peace Corps. Stitches are out, time to pack up and leave.